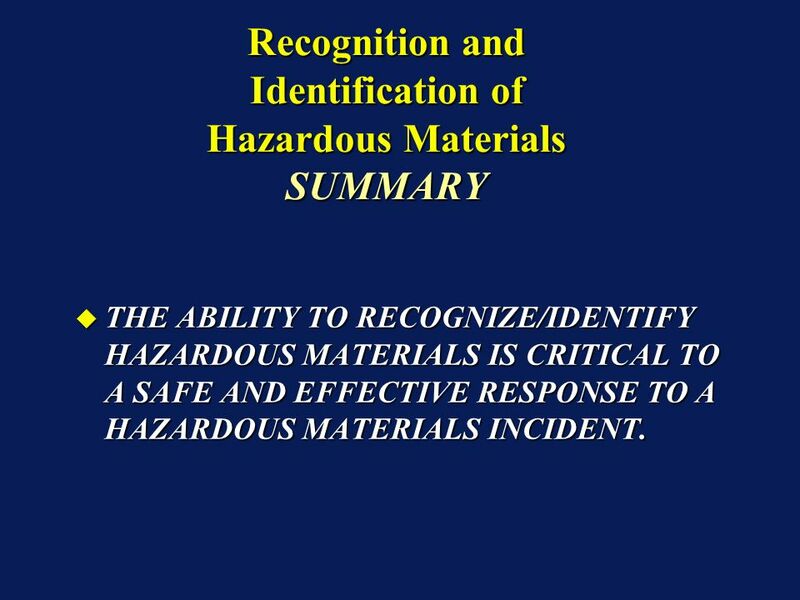 Chapter #7 RECOGNITION & IDENTIFICATION OF HAZARDOUS MATERIALS. 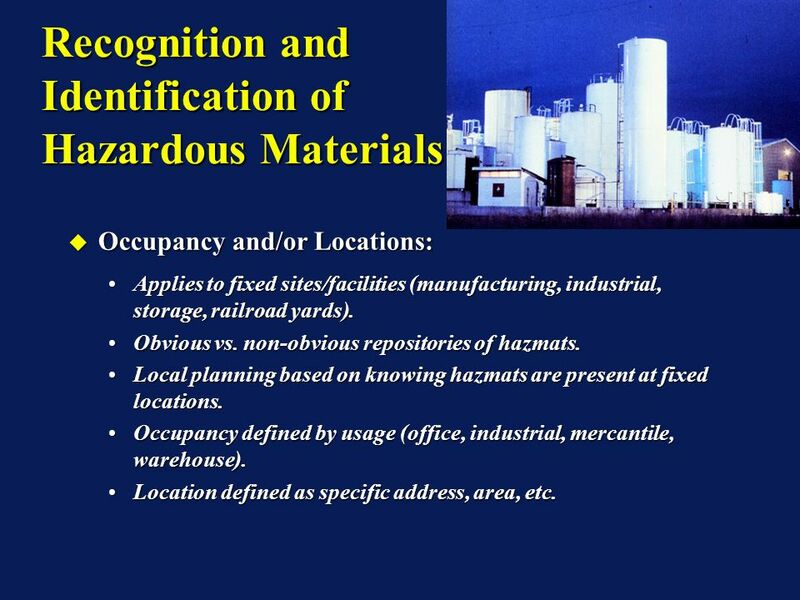 2 Recognition and Identification of Hazardous Materials Introduction Occupancy and locations. Occupancy and locations. Container shapes, markings, and colors. Container shapes, markings, and colors. DOT Placarding and Labeling. DOT Placarding and Labeling. Shipping papers. Shipping papers. NFPA 704 Standard System. NFPA 704 Standard System. Occupancy and locations. Occupancy and locations. Container shapes, markings, and colors. Container shapes, markings, and colors. DOT Placarding and Labeling. DOT Placarding and Labeling. Shipping papers. Shipping papers. NFPA 704 Standard System. NFPA 704 Standard System. 3 Recognition and Identification of Hazardous Materials Occupancy and/or Locations: Occupancy and/or Locations: Applies to fixed sites/facilities (manufacturing, industrial, storage, railroad yards).Applies to fixed sites/facilities (manufacturing, industrial, storage, railroad yards). Obvious vs. non-obvious repositories of hazmats.Obvious vs. non-obvious repositories of hazmats. Local planning based on knowing hazmats are present at fixed locations.Local planning based on knowing hazmats are present at fixed locations. Occupancy defined by usage (office, industrial, mercantile, warehouse).Occupancy defined by usage (office, industrial, mercantile, warehouse). Location defined as specific address, area, etc.Location defined as specific address, area, etc. Occupancy and/or Locations: Occupancy and/or Locations: Applies to fixed sites/facilities (manufacturing, industrial, storage, railroad yards).Applies to fixed sites/facilities (manufacturing, industrial, storage, railroad yards). Obvious vs. non-obvious repositories of hazmats.Obvious vs. non-obvious repositories of hazmats. Local planning based on knowing hazmats are present at fixed locations.Local planning based on knowing hazmats are present at fixed locations. Occupancy defined by usage (office, industrial, mercantile, warehouse).Occupancy defined by usage (office, industrial, mercantile, warehouse). Location defined as specific address, area, etc.Location defined as specific address, area, etc. 4 Recognition and Identification of Hazardous Materials Container and Vehicle Shapes Container and Vehicle Shapes Configuration provides clues to contents (e.g. radioactive, compressed gases, cryogenics, corrosives).Configuration provides clues to contents (e.g. radioactive, compressed gases, cryogenics, corrosives). Container Markings and Colors Container Markings and Colors Tools for recognition and identification.Tools for recognition and identification. Marking systems are voluntary (except as required by law) and vary.Marking systems are voluntary (except as required by law) and vary. Container and Vehicle Shapes Container and Vehicle Shapes Configuration provides clues to contents (e.g. radioactive, compressed gases, cryogenics, corrosives).Configuration provides clues to contents (e.g. radioactive, compressed gases, cryogenics, corrosives). Container Markings and Colors Container Markings and Colors Tools for recognition and identification.Tools for recognition and identification. Marking systems are voluntary (except as required by law) and vary.Marking systems are voluntary (except as required by law) and vary. 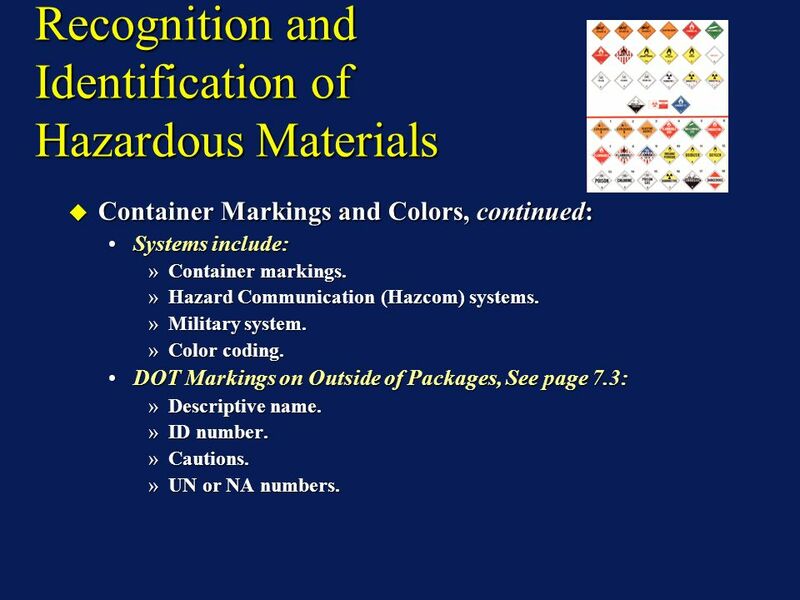 5 Recognition and Identification of Hazardous Materials Container Markings and Colors, continued: Container Markings and Colors, continued: Systems include:Systems include: »Container markings. »Hazard Communication (Hazcom) systems. »Military system. »Color coding. DOT Markings on Outside of Packages, See page 7.3:DOT Markings on Outside of Packages, See page 7.3: »Descriptive name. »ID number. »Cautions. »UN or NA numbers. Container Markings and Colors, continued: Container Markings and Colors, continued: Systems include:Systems include: »Container markings. »Hazard Communication (Hazcom) systems. »Military system. »Color coding. DOT Markings on Outside of Packages, See page 7.3:DOT Markings on Outside of Packages, See page 7.3: »Descriptive name. »ID number. »Cautions. »UN or NA numbers. 6 Recognition and Identification of Hazardous Materials Hazard Materials Identification System (HMIS): Hazard Materials Identification System (HMIS): Used in the workplace to:Used in the workplace to: »Meet OSHA right-to-know requirements. »Provide PPE information. »Meet OSHA Hazcom Standard in conjunction with specific training. Differs from NFPA and EPA:Differs from NFPA and EPA: »Hazard ranking different from NFPA 704. »Protective Equipment Index different from EPA Levels of Protection. Hazard Materials Identification System (HMIS): Hazard Materials Identification System (HMIS): Used in the workplace to:Used in the workplace to: »Meet OSHA right-to-know requirements. »Provide PPE information. »Meet OSHA Hazcom Standard in conjunction with specific training. 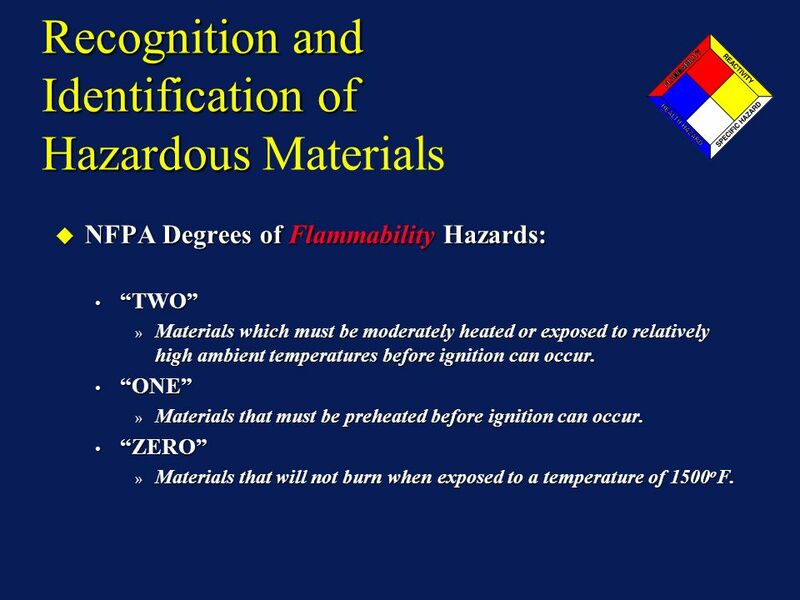 Differs from NFPA and EPA:Differs from NFPA and EPA: »Hazard ranking different from NFPA 704. »Protective Equipment Index different from EPA Levels of Protection. 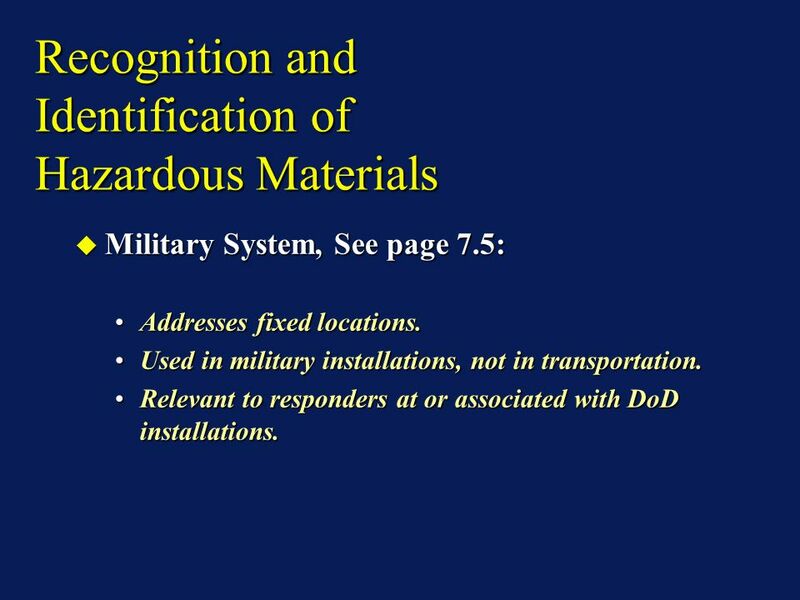 7 Recognition and Identification of Hazardous Materials Military System, See page 7.5: Military System, See page 7.5: Addresses fixed locations.Addresses fixed locations. Used in military installations, not in transportation.Used in military installations, not in transportation. Relevant to responders at or associated with DoD installations.Relevant to responders at or associated with DoD installations. Military System, See page 7.5: Military System, See page 7.5: Addresses fixed locations.Addresses fixed locations. Used in military installations, not in transportation.Used in military installations, not in transportation. Relevant to responders at or associated with DoD installations.Relevant to responders at or associated with DoD installations. 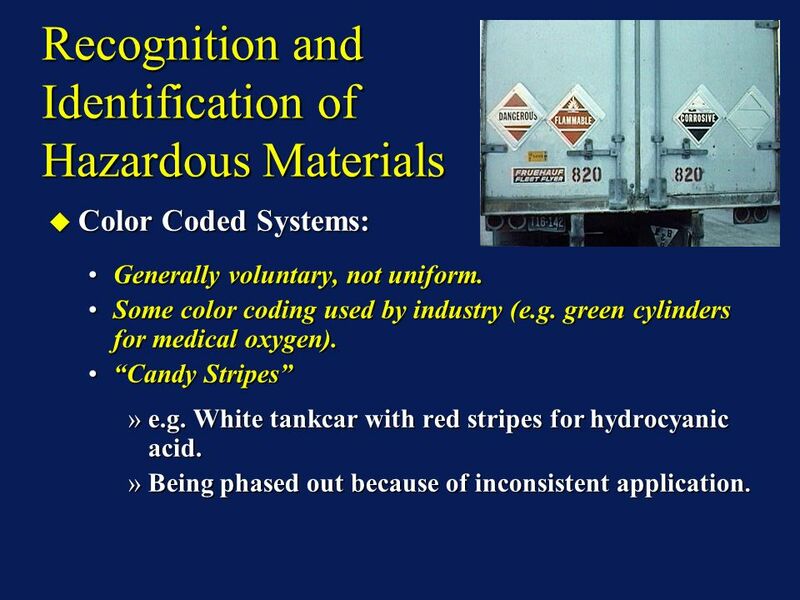 8 Recognition and Identification of Hazardous Materials Color Coded Systems: Color Coded Systems: Generally voluntary, not uniform.Generally voluntary, not uniform. Some color coding used by industry (e.g. green cylinders for medical oxygen).Some color coding used by industry (e.g. green cylinders for medical oxygen). Candy StripesCandy Stripes »e.g. White tankcar with red stripes for hydrocyanic acid. »Being phased out because of inconsistent application. Color Coded Systems: Color Coded Systems: Generally voluntary, not uniform.Generally voluntary, not uniform. Some color coding used by industry (e.g. green cylinders for medical oxygen).Some color coding used by industry (e.g. green cylinders for medical oxygen). Candy StripesCandy Stripes »e.g. White tankcar with red stripes for hydrocyanic acid. »Being phased out because of inconsistent application. 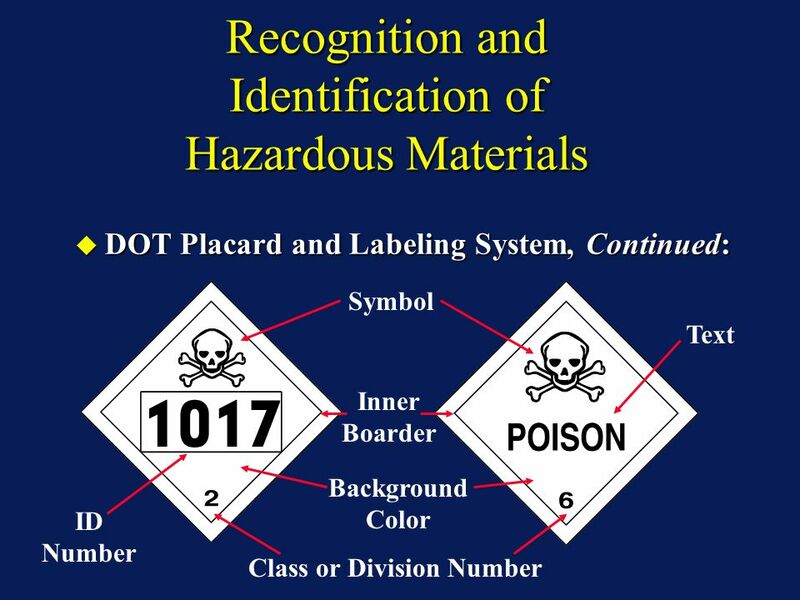 9 Recognition and Identification of Hazardous Materials DOT Placard and Labeling System: DOT Placard and Labeling System: DOT regulates ~2,500 hazardous materials offered for transportation in commerce.DOT regulates ~2,500 hazardous materials offered for transportation in commerce. DOT Hazardous Materials Table in 49 CFR 172.101.DOT Hazardous Materials Table in 49 CFR 172.101. Diamond-shaped labels, 4 inches on each side, required to be affixed on two sides of non-bulk containers.Diamond-shaped labels, 4 inches on each side, required to be affixed on two sides of non-bulk containers. Diamond-shaped placards, 10 ¾ inches on each side, required to be placed on bulk containers.Diamond-shaped placards, 10 ¾ inches on each side, required to be placed on bulk containers. 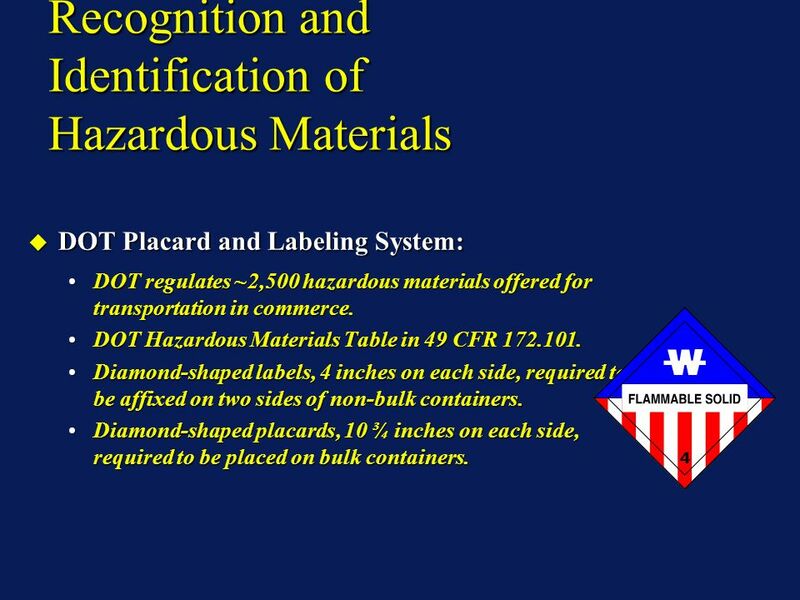 DOT Placard and Labeling System: DOT Placard and Labeling System: DOT regulates ~2,500 hazardous materials offered for transportation in commerce.DOT regulates ~2,500 hazardous materials offered for transportation in commerce. DOT Hazardous Materials Table in 49 CFR 172.101.DOT Hazardous Materials Table in 49 CFR 172.101. Diamond-shaped labels, 4 inches on each side, required to be affixed on two sides of non-bulk containers.Diamond-shaped labels, 4 inches on each side, required to be affixed on two sides of non-bulk containers. Diamond-shaped placards, 10 ¾ inches on each side, required to be placed on bulk containers.Diamond-shaped placards, 10 ¾ inches on each side, required to be placed on bulk containers. 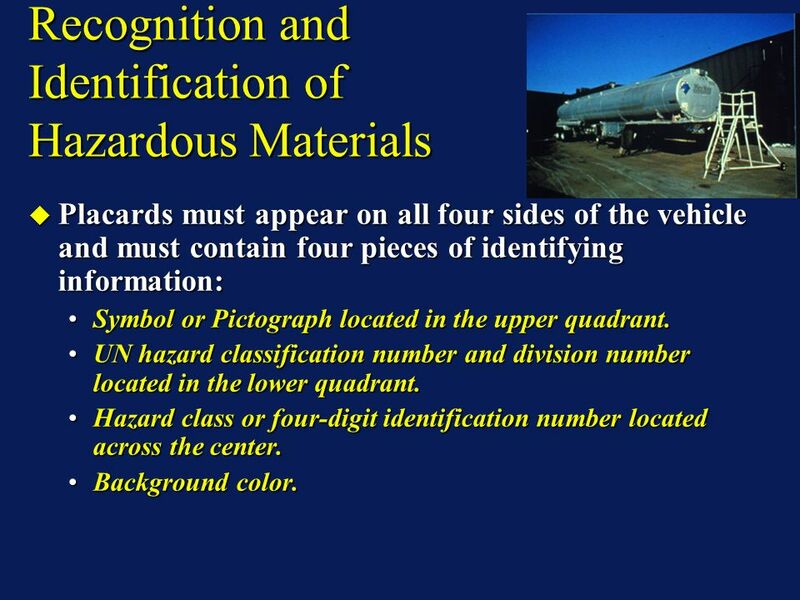 10 Recognition and Identification of Hazardous Materials Placards must appear on all four sides of the vehicle and must contain four pieces of identifying information: Placards must appear on all four sides of the vehicle and must contain four pieces of identifying information: Symbol or Pictograph located in the upper quadrant.Symbol or Pictograph located in the upper quadrant. UN hazard classification number and division number located in the lower quadrant.UN hazard classification number and division number located in the lower quadrant. Hazard class or four-digit identification number located across the center.Hazard class or four-digit identification number located across the center. Background color.Background color. Placards must appear on all four sides of the vehicle and must contain four pieces of identifying information: Placards must appear on all four sides of the vehicle and must contain four pieces of identifying information: Symbol or Pictograph located in the upper quadrant.Symbol or Pictograph located in the upper quadrant. 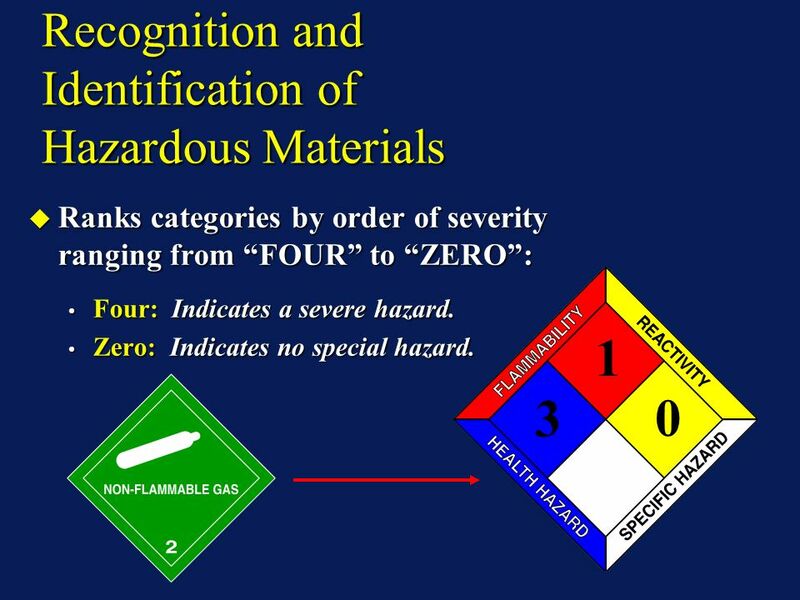 UN hazard classification number and division number located in the lower quadrant.UN hazard classification number and division number located in the lower quadrant. Hazard class or four-digit identification number located across the center.Hazard class or four-digit identification number located across the center. Background color.Background color. 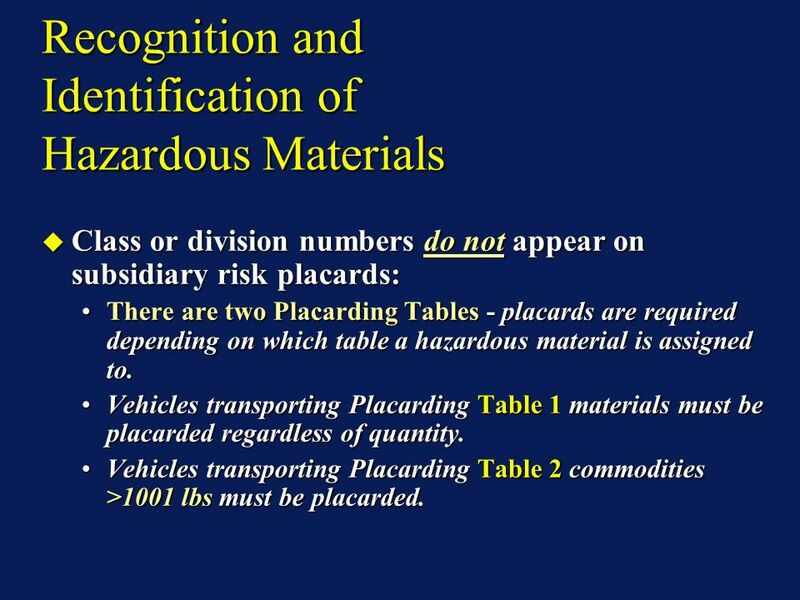 12 Recognition and Identification of Hazardous Materials Class or division numbers do not appear on subsidiary risk placards: Class or division numbers do not appear on subsidiary risk placards: There are two Placarding Tables - placards are required depending on which table a hazardous material is assigned to.There are two Placarding Tables - placards are required depending on which table a hazardous material is assigned to. Vehicles transporting Placarding Table 1 materials must be placarded regardless of quantity.Vehicles transporting Placarding Table 1 materials must be placarded regardless of quantity. Vehicles transporting Placarding Table 2 commodities >1001 lbs must be placarded.Vehicles transporting Placarding Table 2 commodities >1001 lbs must be placarded. 13 Recognition and Identification of Hazardous Materials Dangerous Placard: Dangerous Placard: 1001 pounds (454 kilograms) gross weight of two or more categories of hazardous materials listed in Table 2.1001 pounds (454 kilograms) gross weight of two or more categories of hazardous materials listed in Table 2. Non-bulk packaging with two or more categories that require different placards specified in Table 2 may be placarded with the Dangerous placard.Non-bulk packaging with two or more categories that require different placards specified in Table 2 may be placarded with the Dangerous placard. »When 5000 lbs. or more of one category of material is loaded at one loading facility - apply the placard specified in Table 2. 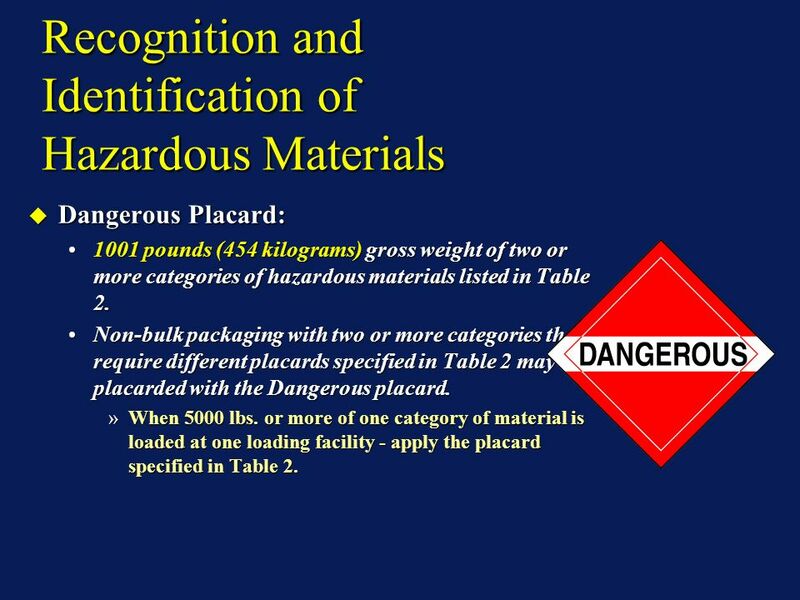 Dangerous Placard: Dangerous Placard: 1001 pounds (454 kilograms) gross weight of two or more categories of hazardous materials listed in Table 2.1001 pounds (454 kilograms) gross weight of two or more categories of hazardous materials listed in Table 2. Non-bulk packaging with two or more categories that require different placards specified in Table 2 may be placarded with the Dangerous placard.Non-bulk packaging with two or more categories that require different placards specified in Table 2 may be placarded with the Dangerous placard. »When 5000 lbs. or more of one category of material is loaded at one loading facility - apply the placard specified in Table 2. 15 Recognition and of Hazardous Materials Recognition and Identification of Hazardous Materials Hazard Class 1 - Explosives: Hazard Class 1 - Explosives: Any substance or article, including a device, which is designed to function by explosion (extremely rapid release of gas and heat). Any substance or article, including a device, which is designed to function by explosion (extremely rapid release of gas and heat). 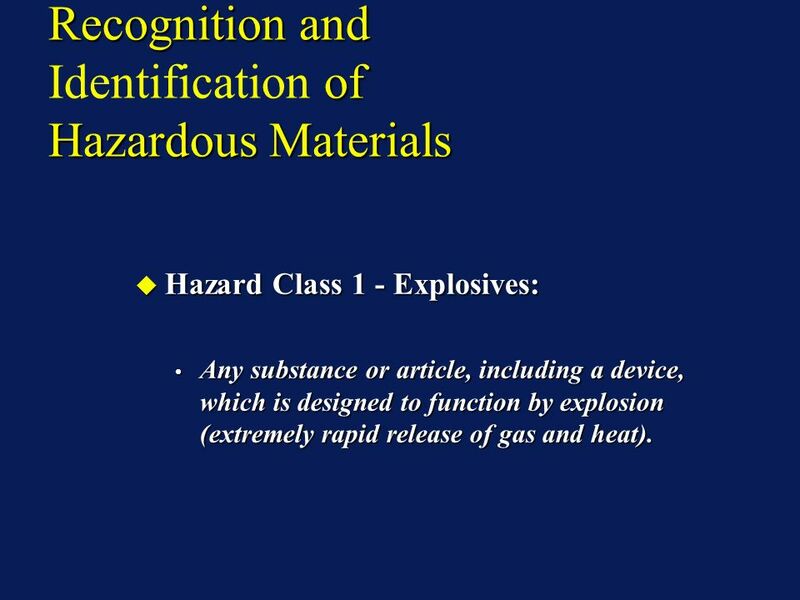 Hazard Class 1 - Explosives: Hazard Class 1 - Explosives: Any substance or article, including a device, which is designed to function by explosion (extremely rapid release of gas and heat). Any substance or article, including a device, which is designed to function by explosion (extremely rapid release of gas and heat). 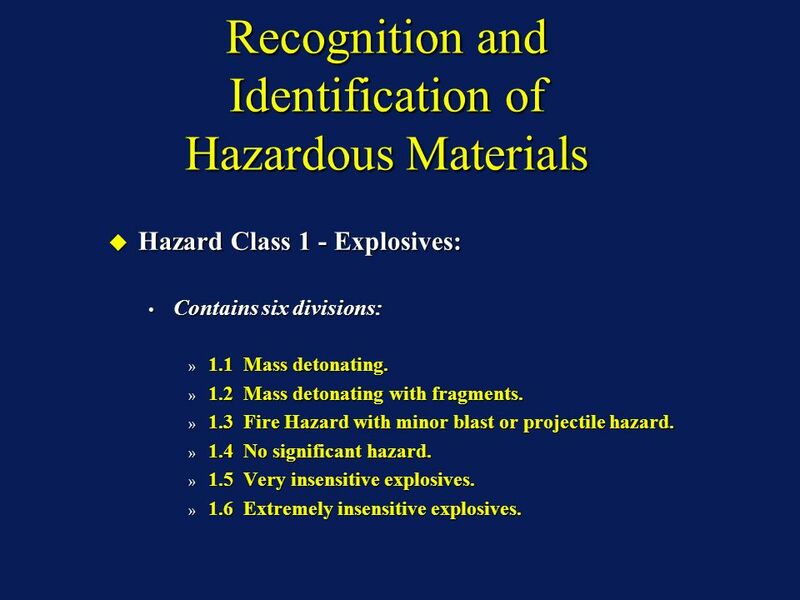 17 Recognition and Identification of Hazardous Materials Hazard Class 1 - Explosives: Hazard Class 1 - Explosives: Contains six divisions: Contains six divisions: » 1.1 Mass detonating. » 1.2 Mass detonating with fragments. » 1.3 Fire Hazard with minor blast or projectile hazard. » 1.4 No significant hazard. » 1.5 Very insensitive explosives. » 1.6 Extremely insensitive explosives. Hazard Class 1 - Explosives: Hazard Class 1 - Explosives: Contains six divisions: Contains six divisions: » 1.1 Mass detonating. » 1.2 Mass detonating with fragments. » 1.3 Fire Hazard with minor blast or projectile hazard. » 1.4 No significant hazard. » 1.5 Very insensitive explosives. » 1.6 Extremely insensitive explosives. 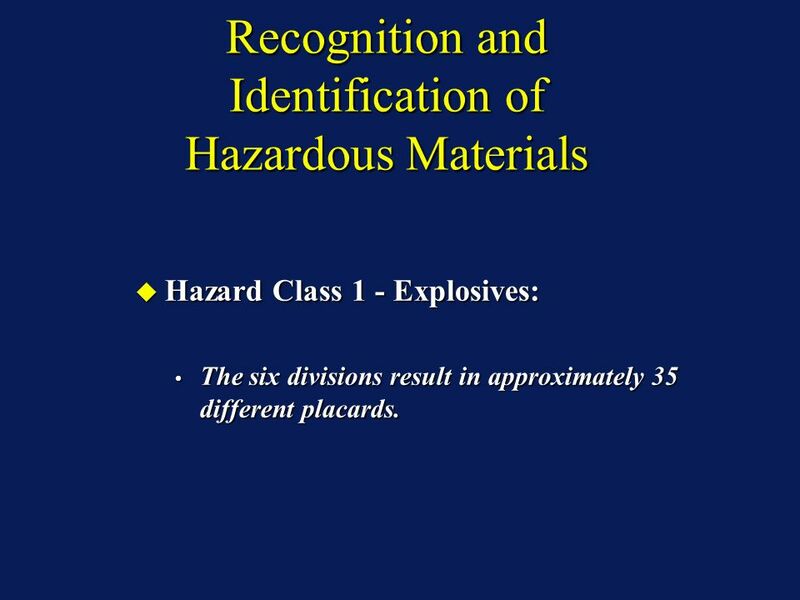 18 Recognition and Identification of Hazardous Materials Hazard Class 1 - Explosives: Hazard Class 1 - Explosives: The six divisions result in approximately 35 different placards. The six divisions result in approximately 35 different placards. 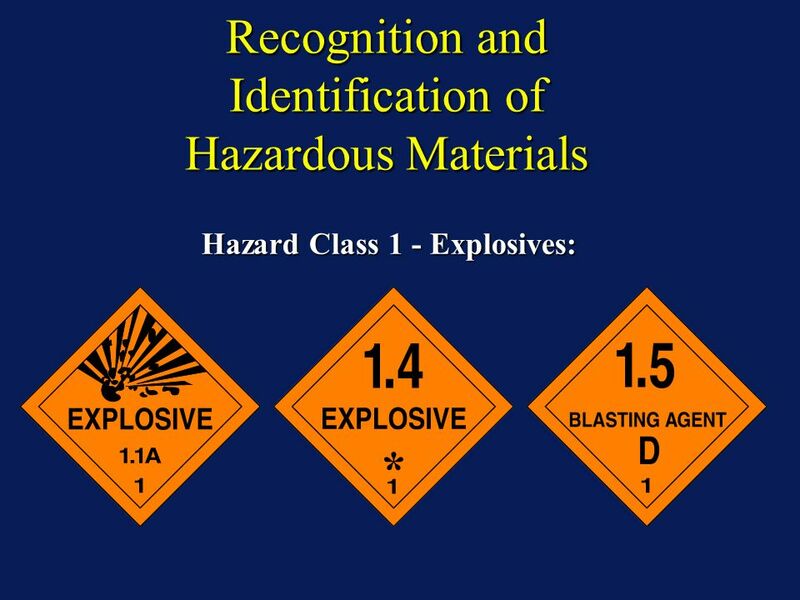 Hazard Class 1 - Explosives: Hazard Class 1 - Explosives: The six divisions result in approximately 35 different placards. The six divisions result in approximately 35 different placards. 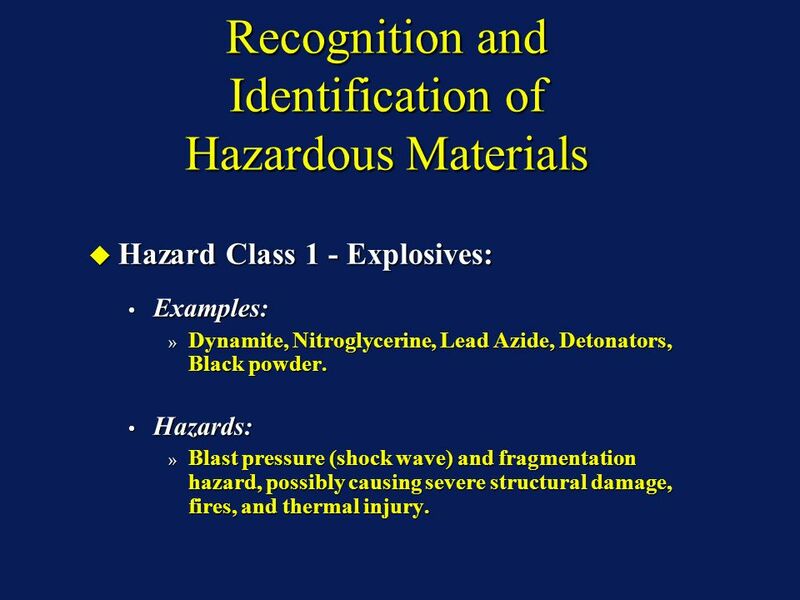 19 Recognition and Identification of Hazardous Materials Hazard Class 1 - Explosives: Hazard Class 1 - Explosives: Examples: Examples: » Dynamite, Nitroglycerine, Lead Azide, Detonators, Black powder. Hazards: Hazards: » Blast pressure (shock wave) and fragmentation hazard, possibly causing severe structural damage, fires, and thermal injury. Hazard Class 1 - Explosives: Hazard Class 1 - Explosives: Examples: Examples: » Dynamite, Nitroglycerine, Lead Azide, Detonators, Black powder. Hazards: Hazards: » Blast pressure (shock wave) and fragmentation hazard, possibly causing severe structural damage, fires, and thermal injury. 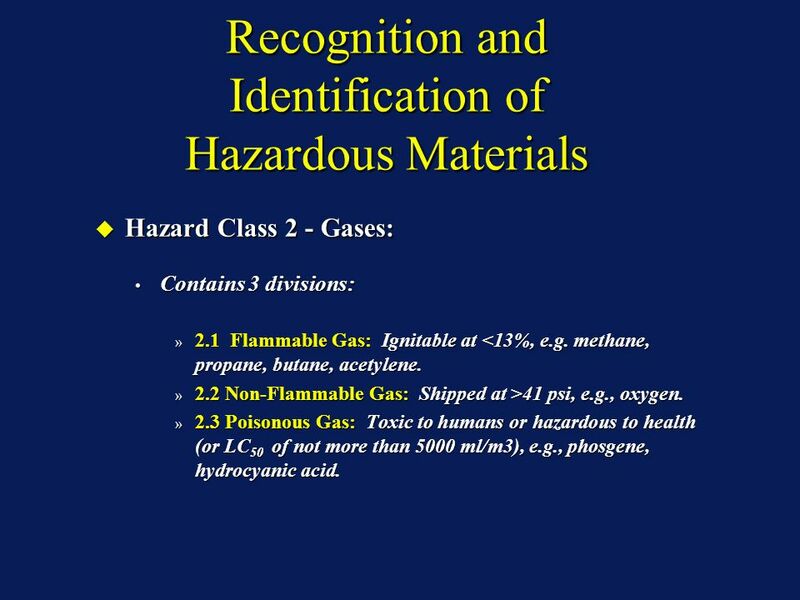 20 Recognition and Identification of Hazardous Materials Hazard Class 2 - Gases: Hazard Class 2 - Gases: Contains 3 divisions: Contains 3 divisions: » 2.1 Flammable Gas: Ignitable at <13%, e.g. methane, propane, butane, acetylene. » 2.2 Non-Flammable Gas: Shipped at >41 psi, e.g., oxygen. » 2.3 Poisonous Gas: Toxic to humans or hazardous to health (or LC 50 of not more than 5000 ml/m3), e.g., phosgene, hydrocyanic acid. Hazard Class 2 - Gases: Hazard Class 2 - Gases: Contains 3 divisions: Contains 3 divisions: » 2.1 Flammable Gas: Ignitable at <13%, e.g. methane, propane, butane, acetylene. » 2.2 Non-Flammable Gas: Shipped at >41 psi, e.g., oxygen. » 2.3 Poisonous Gas: Toxic to humans or hazardous to health (or LC 50 of not more than 5000 ml/m3), e.g., phosgene, hydrocyanic acid. 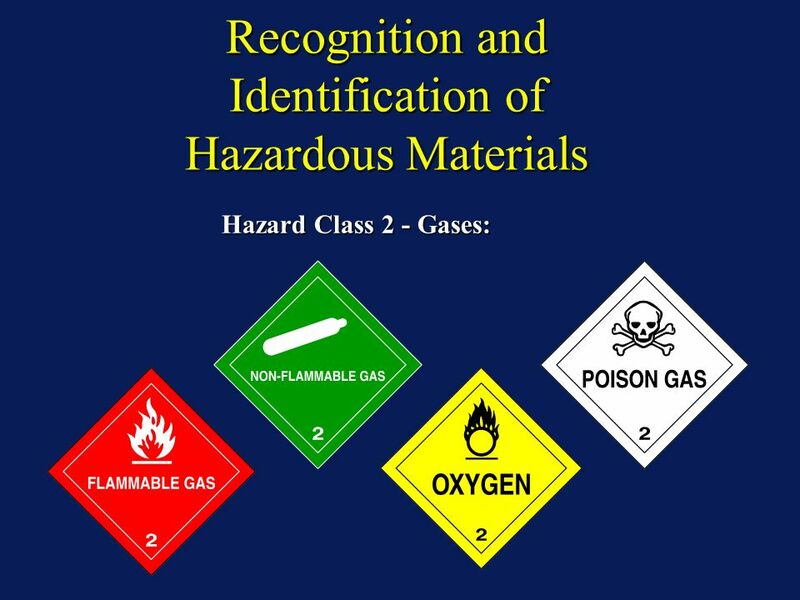 22 Recognition and Identification of Hazardous Materials Hazard Class 2 - Gases: Hazard Class 2 - Gases: Hazards: Hazards: » 2.1 - Fire and explosion hazard. BLEVE potential. Corrosive, toxic, unstable. » 2.2 - Can be corrosive, toxic, oxidizer, or burn. » 2.3 - Can cause illness, injury, or death. Corrosive, flammable, or explosive. Hazard Class 2 - Gases: Hazard Class 2 - Gases: Hazards: Hazards: » 2.1 - Fire and explosion hazard. BLEVE potential. Corrosive, toxic, unstable. » 2.2 - Can be corrosive, toxic, oxidizer, or burn. » 2.3 - Can cause illness, injury, or death. Corrosive, flammable, or explosive. 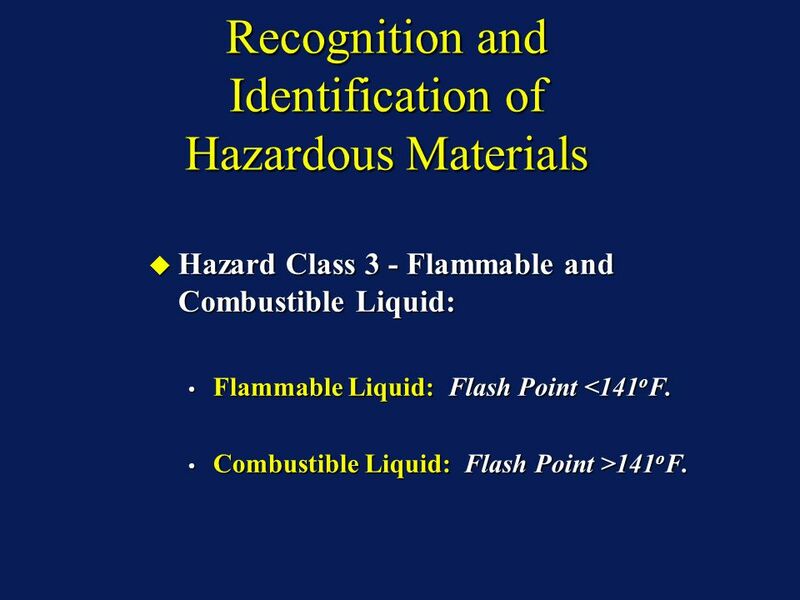 23 Recognition and Identification of Hazardous Materials Hazard Class 3 - Flammable and Combustible Liquid: Hazard Class 3 - Flammable and Combustible Liquid: Flammable Liquid: Flash Point <141 o F. Flammable Liquid: Flash Point <141 o F. Combustible Liquid: Flash Point >141 o F. Combustible Liquid: Flash Point >141 o F. Hazard Class 3 - Flammable and Combustible Liquid: Hazard Class 3 - Flammable and Combustible Liquid: Flammable Liquid: Flash Point <141 o F. Flammable Liquid: Flash Point <141 o F. Combustible Liquid: Flash Point >141 o F. Combustible Liquid: Flash Point >141 o F.
25 Recognition and Identification of Hazardous Materials Hazard Class 3 - Flammable and Combustible Liquid: Hazard Class 3 - Flammable and Combustible Liquid: Examples of Flammable Liquid: Acetone, Benzene, Octane, Ethyl Alcohol, MEK. Examples of Flammable Liquid: Acetone, Benzene, Octane, Ethyl Alcohol, MEK. Examples of Combustible Liquid: Diesel, Fuel Oil, Solvents. Examples of Combustible Liquid: Diesel, Fuel Oil, Solvents. 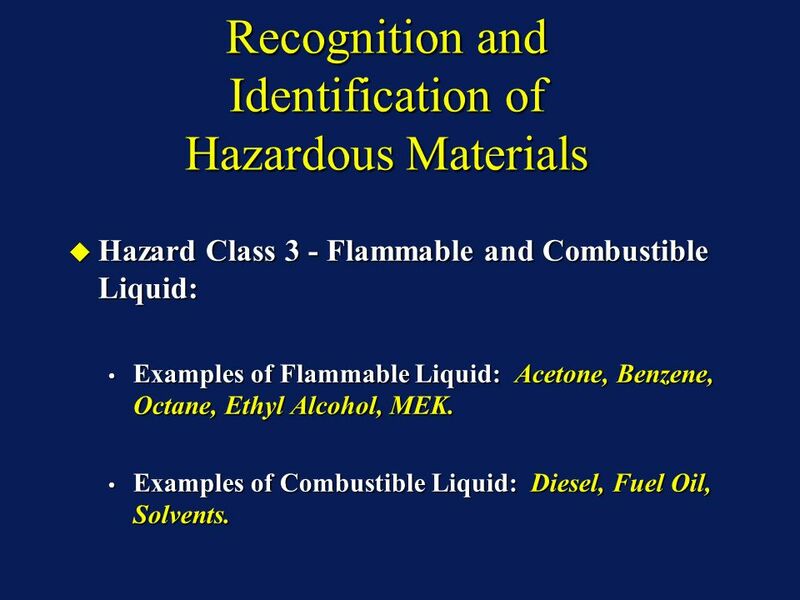 Hazard Class 3 - Flammable and Combustible Liquid: Hazard Class 3 - Flammable and Combustible Liquid: Examples of Flammable Liquid: Acetone, Benzene, Octane, Ethyl Alcohol, MEK. Examples of Flammable Liquid: Acetone, Benzene, Octane, Ethyl Alcohol, MEK. Examples of Combustible Liquid: Diesel, Fuel Oil, Solvents. Examples of Combustible Liquid: Diesel, Fuel Oil, Solvents. 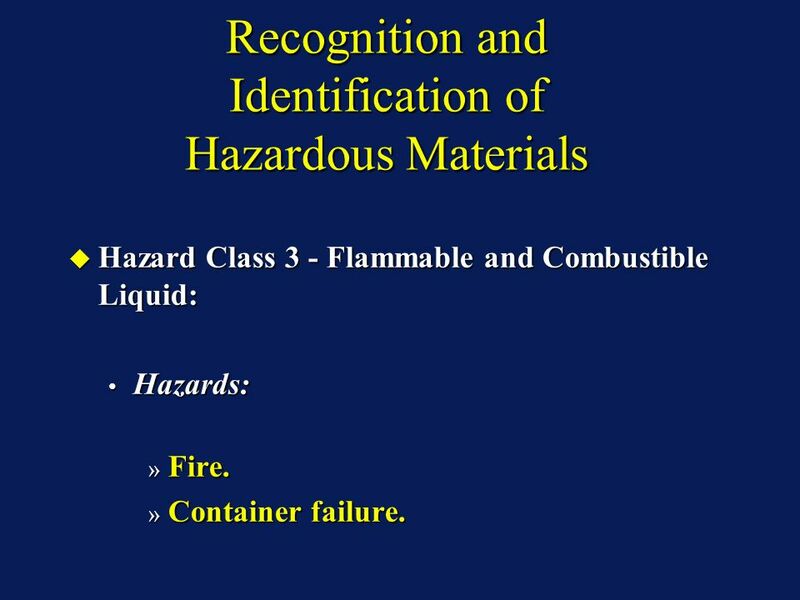 26 Recognition and Identification of Hazardous Materials Hazard Class 3 - Flammable and Combustible Liquid: Hazard Class 3 - Flammable and Combustible Liquid: Hazards: Hazards: » Fire. » Container failure. Hazard Class 3 - Flammable and Combustible Liquid: Hazard Class 3 - Flammable and Combustible Liquid: Hazards: Hazards: » Fire. » Container failure. 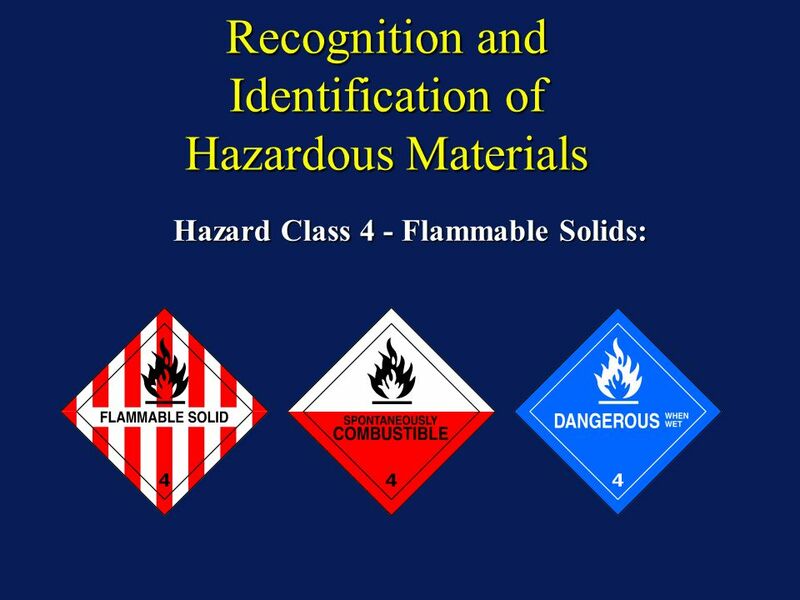 27 Recognition and Identification of Hazardous Materials Hazard Class 4 - Flammable Solids: Hazard Class 4 - Flammable Solids: Contains 3 divisions:Contains 3 divisions: » 4.1 - Flammable Solid: Explosives shipped with sufficient wetting agent to suppress explosive properties. Self-reactive materials. Readily combustible solids which may cause fire through friction. 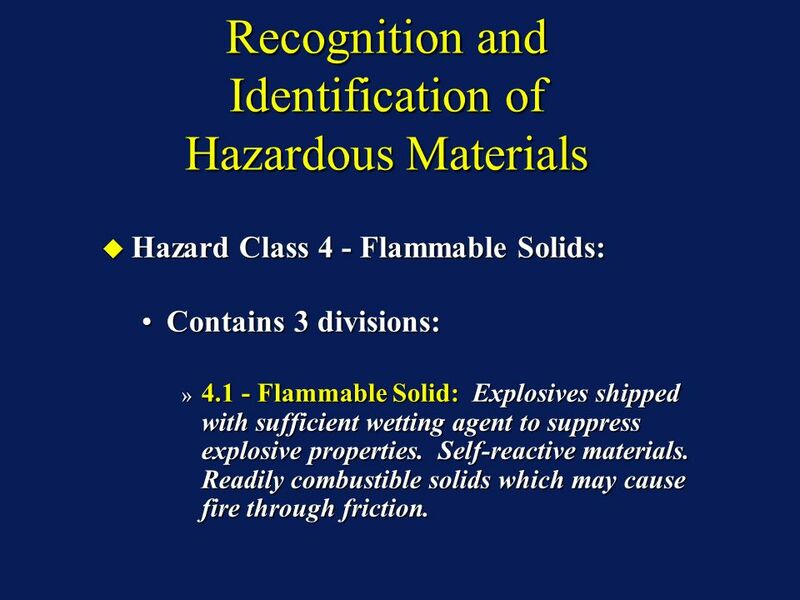 Hazard Class 4 - Flammable Solids: Hazard Class 4 - Flammable Solids: Contains 3 divisions:Contains 3 divisions: » 4.1 - Flammable Solid: Explosives shipped with sufficient wetting agent to suppress explosive properties. Self-reactive materials. Readily combustible solids which may cause fire through friction. 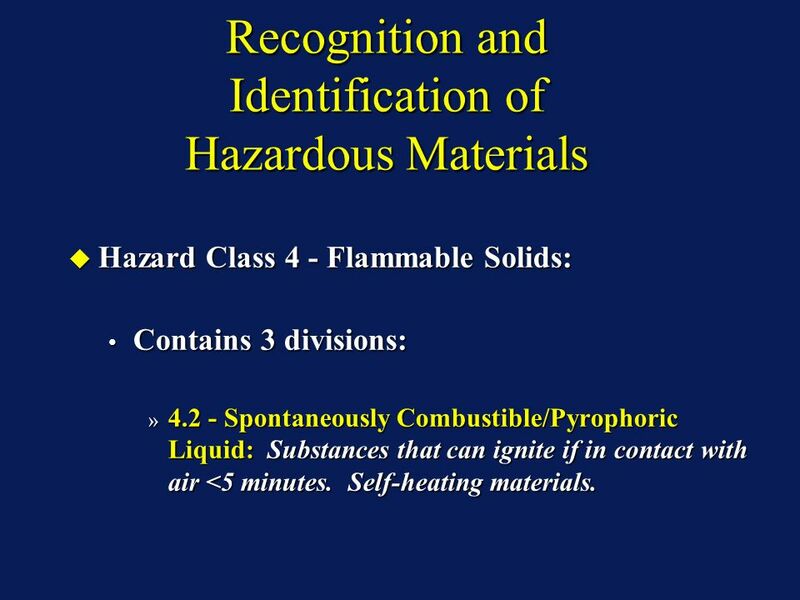 28 Recognition and Identification of Hazardous Materials Hazard Class 4 - Flammable Solids: Hazard Class 4 - Flammable Solids: Contains 3 divisions: Contains 3 divisions: » 4.2 - Spontaneously Combustible/Pyrophoric Liquid: Substances that can ignite if in contact with air <5 minutes. Self-heating materials. Hazard Class 4 - Flammable Solids: Hazard Class 4 - Flammable Solids: Contains 3 divisions: Contains 3 divisions: » 4.2 - Spontaneously Combustible/Pyrophoric Liquid: Substances that can ignite if in contact with air <5 minutes. Self-heating materials. 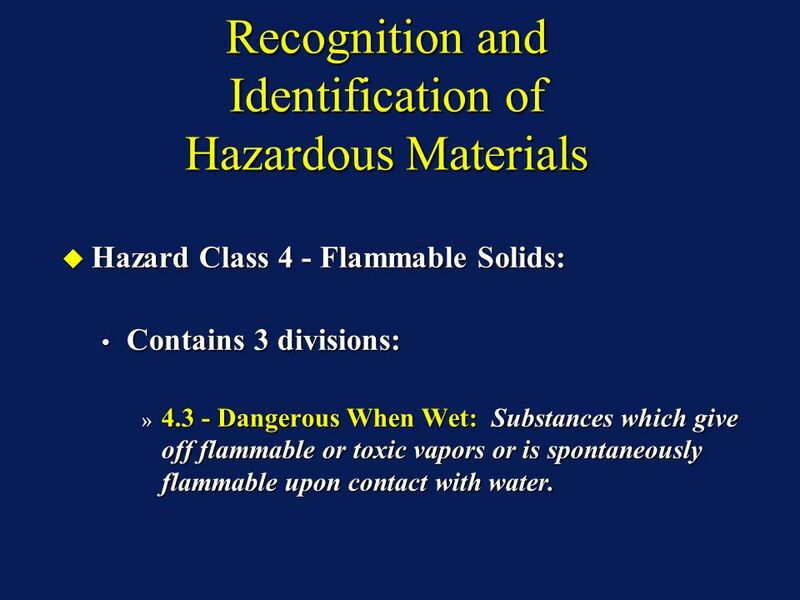 29 Recognition and Identification of Hazardous Materials Hazard Class 4 - Flammable Solids: Hazard Class 4 - Flammable Solids: Contains 3 divisions: Contains 3 divisions: » 4.3 - Dangerous When Wet: Substances which give off flammable or toxic vapors or is spontaneously flammable upon contact with water. Hazard Class 4 - Flammable Solids: Hazard Class 4 - Flammable Solids: Contains 3 divisions: Contains 3 divisions: » 4.3 - Dangerous When Wet: Substances which give off flammable or toxic vapors or is spontaneously flammable upon contact with water. 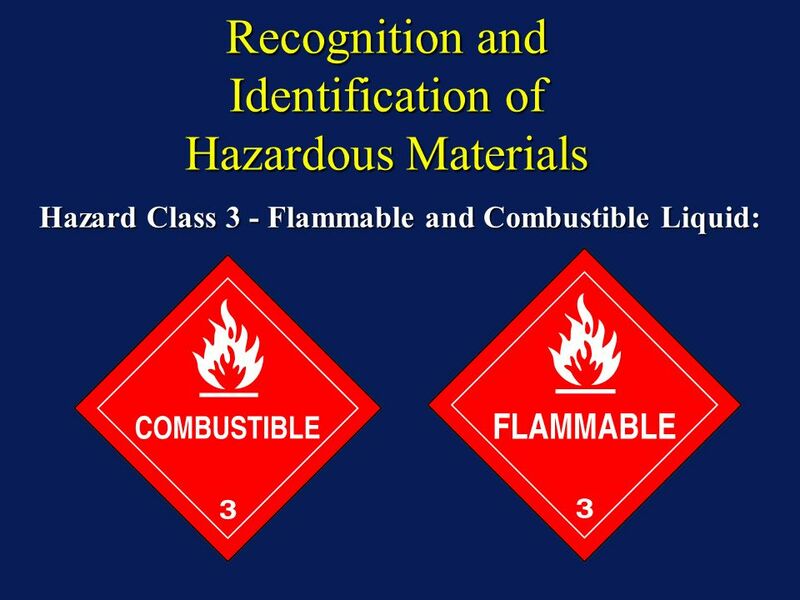 31 Recognition and Identification of Hazardous Materials Hazard Class 4 - Flammable Solids: Hazard Class 4 - Flammable Solids: Examples: Magnesium, Phosphorus, Metallic Sodium, Potassium, Calcium Carbide. Examples: Magnesium, Phosphorus, Metallic Sodium, Potassium, Calcium Carbide. Hazards: Hazards: » Flammable - some spontaneously. » May be water reactive, toxic and/or corrosive. » May be extremely difficult to extinguish. 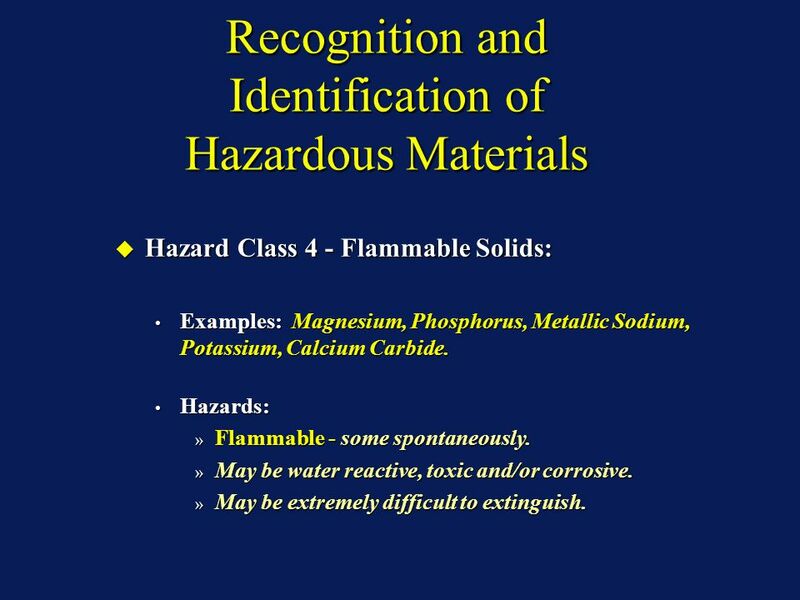 Hazard Class 4 - Flammable Solids: Hazard Class 4 - Flammable Solids: Examples: Magnesium, Phosphorus, Metallic Sodium, Potassium, Calcium Carbide. Examples: Magnesium, Phosphorus, Metallic Sodium, Potassium, Calcium Carbide. Hazards: Hazards: » Flammable - some spontaneously. » May be water reactive, toxic and/or corrosive. » May be extremely difficult to extinguish. 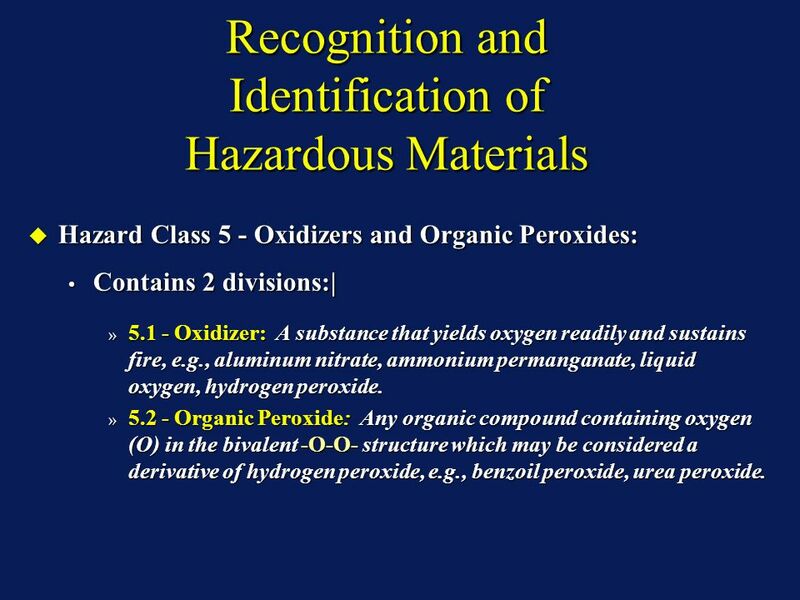 32 Recognition and Identification of Hazardous Materials Hazard Class 5 - Oxidizers and Organic Peroxides: Hazard Class 5 - Oxidizers and Organic Peroxides: Contains 2 divisions:| Contains 2 divisions:| » 5.1 - Oxidizer: A substance that yields oxygen readily and sustains fire, e.g., aluminum nitrate, ammonium permanganate, liquid oxygen, hydrogen peroxide. » 5.2 - Organic Peroxide: Any organic compound containing oxygen (O) in the bivalent -O-O- structure which may be considered a derivative of hydrogen peroxide, e.g., benzoil peroxide, urea peroxide. Hazard Class 5 - Oxidizers and Organic Peroxides: Hazard Class 5 - Oxidizers and Organic Peroxides: Contains 2 divisions:| Contains 2 divisions:| » 5.1 - Oxidizer: A substance that yields oxygen readily and sustains fire, e.g., aluminum nitrate, ammonium permanganate, liquid oxygen, hydrogen peroxide. » 5.2 - Organic Peroxide: Any organic compound containing oxygen (O) in the bivalent -O-O- structure which may be considered a derivative of hydrogen peroxide, e.g., benzoil peroxide, urea peroxide. 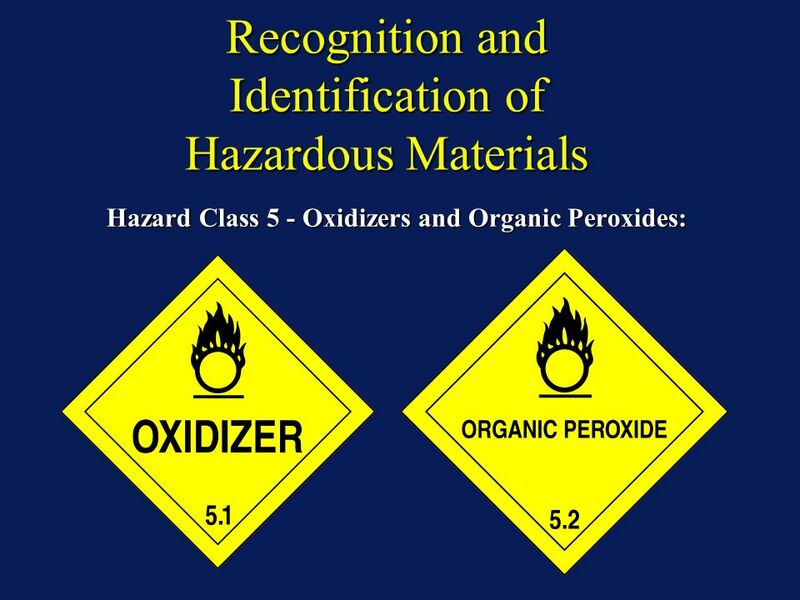 34 Recognition and Identification of Hazardous Materials Hazard Class 5 - Oxidizers and Organic Peroxides: Hazard Class 5 - Oxidizers and Organic Peroxides: Hazards: Hazards: » Supports combustion. » May be unstable. » Can be toxic and/or corrosive. Organic Peroxides are more dangerous than Oxidizers and can detonate. Organic Peroxides are more dangerous than Oxidizers and can detonate. 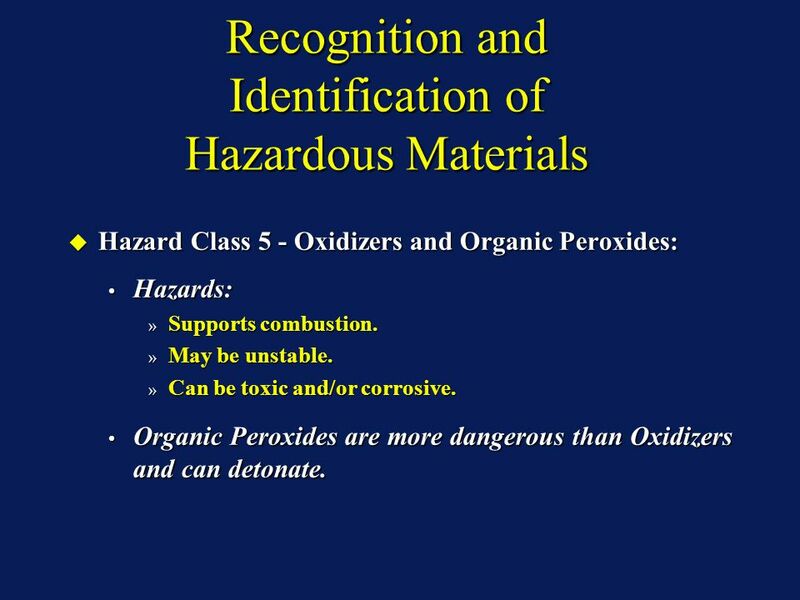 Hazard Class 5 - Oxidizers and Organic Peroxides: Hazard Class 5 - Oxidizers and Organic Peroxides: Hazards: Hazards: » Supports combustion. » May be unstable. » Can be toxic and/or corrosive. Organic Peroxides are more dangerous than Oxidizers and can detonate. Organic Peroxides are more dangerous than Oxidizers and can detonate. 35 Recognition and Identification of Hazardous Materials Hazard Class 6: Poisonous and Infectious Substances: Hazard Class 6: Poisonous and Infectious Substances: Contains two divisions:Contains two divisions: » 6.1 Poisonous Materials: A material, other than a gas, which is known to be so toxic to humans as to afford a health hazard during transportation. » 6.2 Infectious Substances: A viable microorganism, or its toxin, that causes or may cause disease in humans or animals and any other agent that causes or may cause severe, disabling or fatal disease. Hazard Class 6: Poisonous and Infectious Substances: Hazard Class 6: Poisonous and Infectious Substances: Contains two divisions:Contains two divisions: » 6.1 Poisonous Materials: A material, other than a gas, which is known to be so toxic to humans as to afford a health hazard during transportation. » 6.2 Infectious Substances: A viable microorganism, or its toxin, that causes or may cause disease in humans or animals and any other agent that causes or may cause severe, disabling or fatal disease. 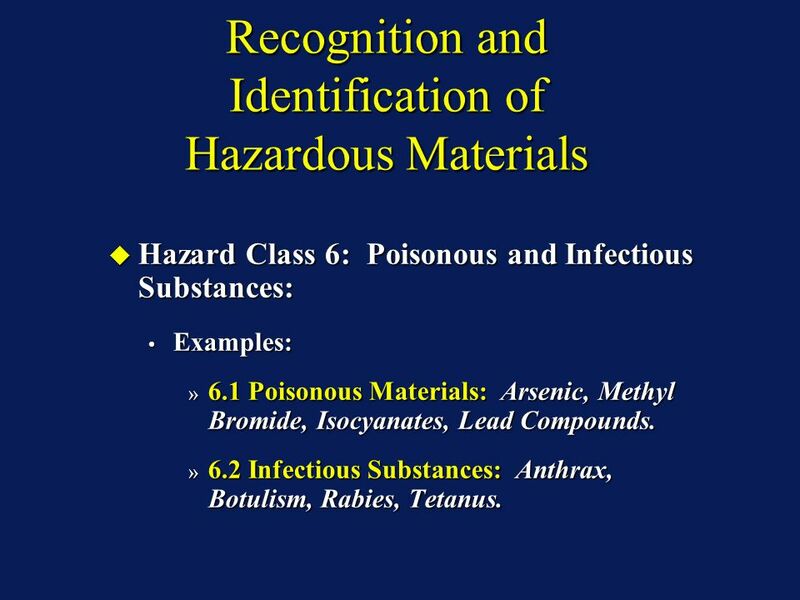 37 Recognition and Identification of Hazardous Materials Hazard Class 6: Poisonous and Infectious Substances: Hazard Class 6: Poisonous and Infectious Substances: Examples: Examples: » 6.1 Poisonous Materials: Arsenic, Methyl Bromide, Isocyanates, Lead Compounds. » 6.2 Infectious Substances: Anthrax, Botulism, Rabies, Tetanus. 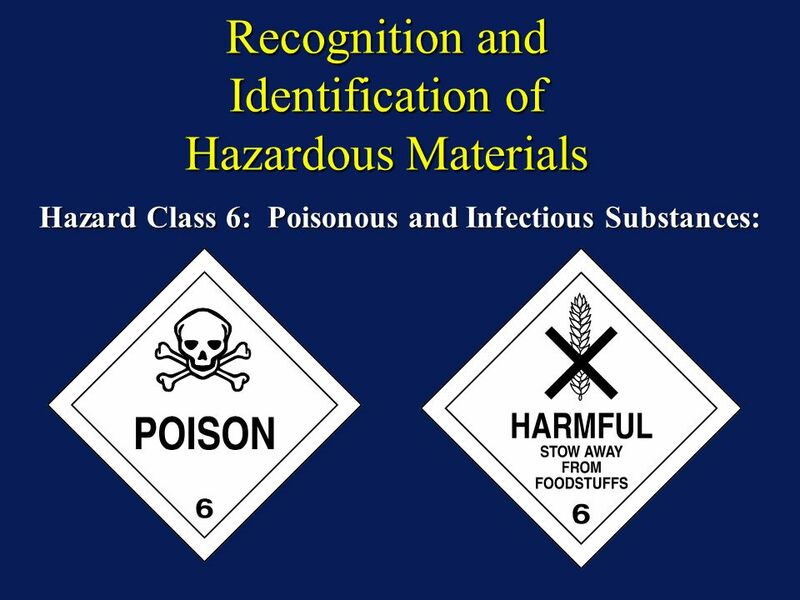 Hazard Class 6: Poisonous and Infectious Substances: Hazard Class 6: Poisonous and Infectious Substances: Examples: Examples: » 6.1 Poisonous Materials: Arsenic, Methyl Bromide, Isocyanates, Lead Compounds. » 6.2 Infectious Substances: Anthrax, Botulism, Rabies, Tetanus. 38 Recognition and Identification of Hazardous Materials Hazard Class 6: Poisonous and Infectious Substances: Hazard Class 6: Poisonous and Infectious Substances: Hazards: When inhaled, ingested, or absorbed into the body:Hazards: When inhaled, ingested, or absorbed into the body: » May cause injury or death. » May cause illness. 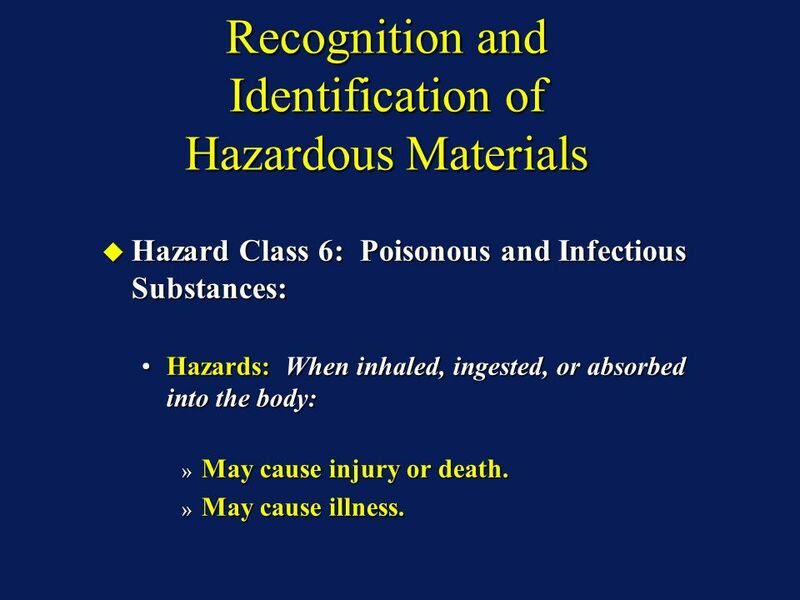 Hazard Class 6: Poisonous and Infectious Substances: Hazard Class 6: Poisonous and Infectious Substances: Hazards: When inhaled, ingested, or absorbed into the body:Hazards: When inhaled, ingested, or absorbed into the body: » May cause injury or death. » May cause illness. 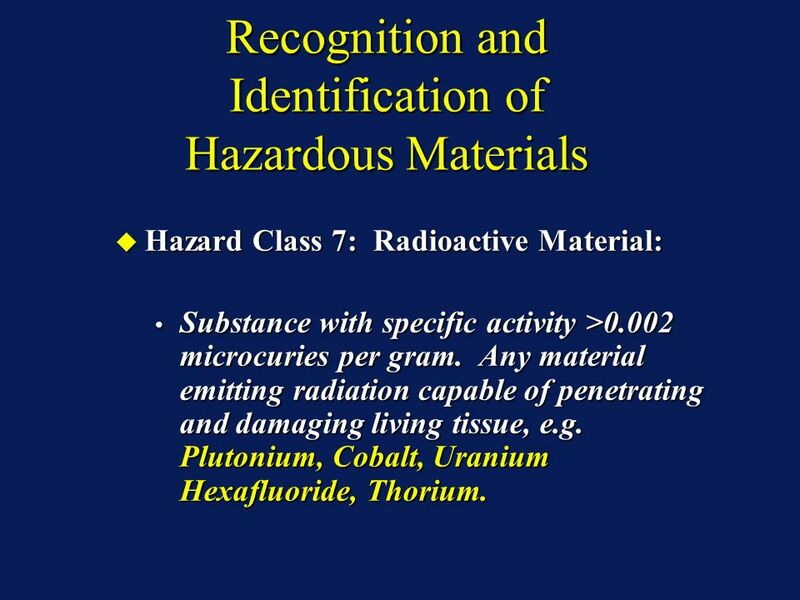 39 Recognition and Identification of Hazardous Materials Hazard Class 7: Radioactive Material: Hazard Class 7: Radioactive Material: Substance with specific activity >0.002 microcuries per gram. Any material emitting radiation capable of penetrating and damaging living tissue, e.g. Plutonium, Cobalt, Uranium Hexafluoride, Thorium. Substance with specific activity >0.002 microcuries per gram. Any material emitting radiation capable of penetrating and damaging living tissue, e.g. Plutonium, Cobalt, Uranium Hexafluoride, Thorium. 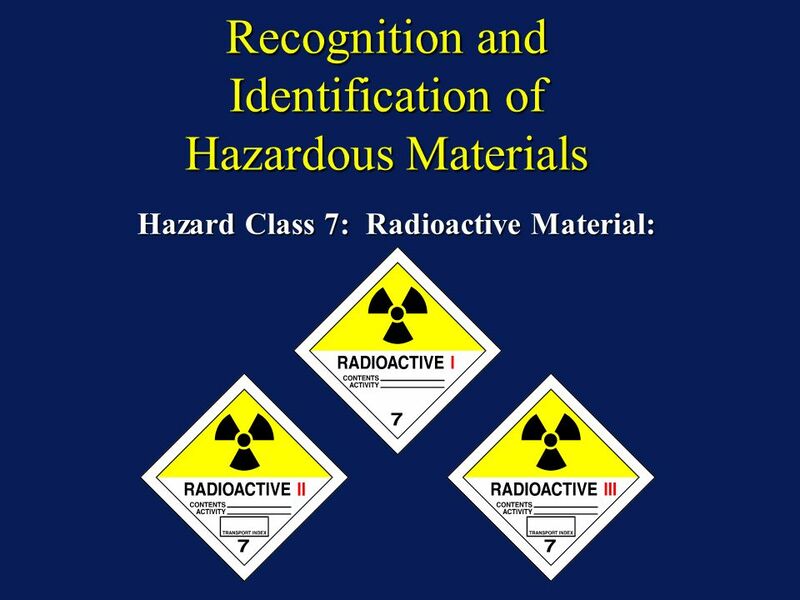 41 Recognition and Identification of Hazardous Materials Hazard Class 7: Radioactive Material: Hazard Class 7: Radioactive Material: Hazards: Hazards: » May cause radiation burns. » May cause illness. » May cause cancer. » May result in death. » Fire may produce irritating or poisonous gases. 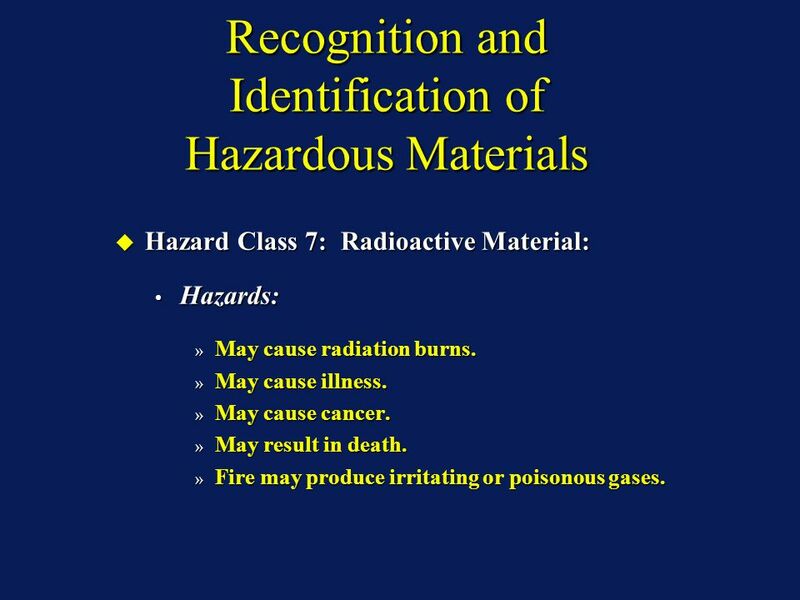 Hazard Class 7: Radioactive Material: Hazard Class 7: Radioactive Material: Hazards: Hazards: » May cause radiation burns. » May cause illness. » May cause cancer. » May result in death. » Fire may produce irritating or poisonous gases. 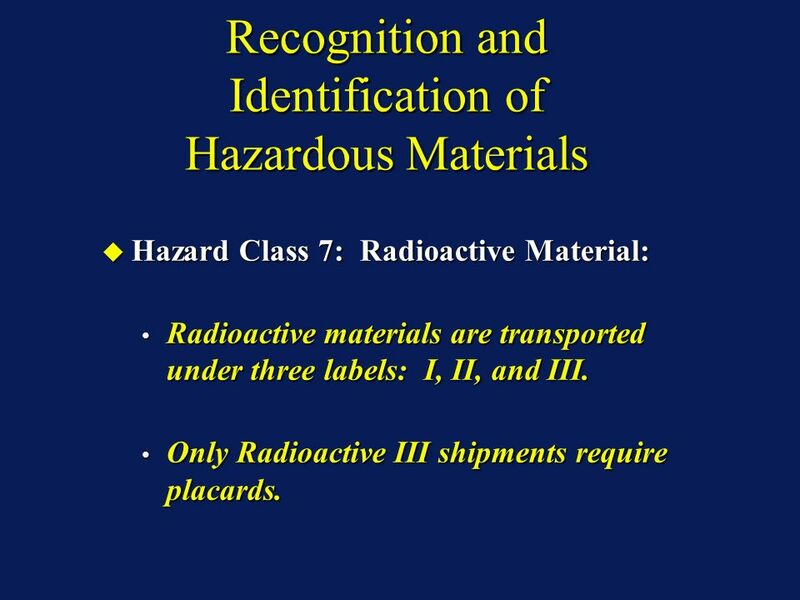 42 Recognition and Identification of Hazardous Materials Hazard Class 7: Radioactive Material: Hazard Class 7: Radioactive Material: Radioactive materials are transported under three labels: I, II, and III. Radioactive materials are transported under three labels: I, II, and III. Only Radioactive III shipments require placards. Only Radioactive III shipments require placards. 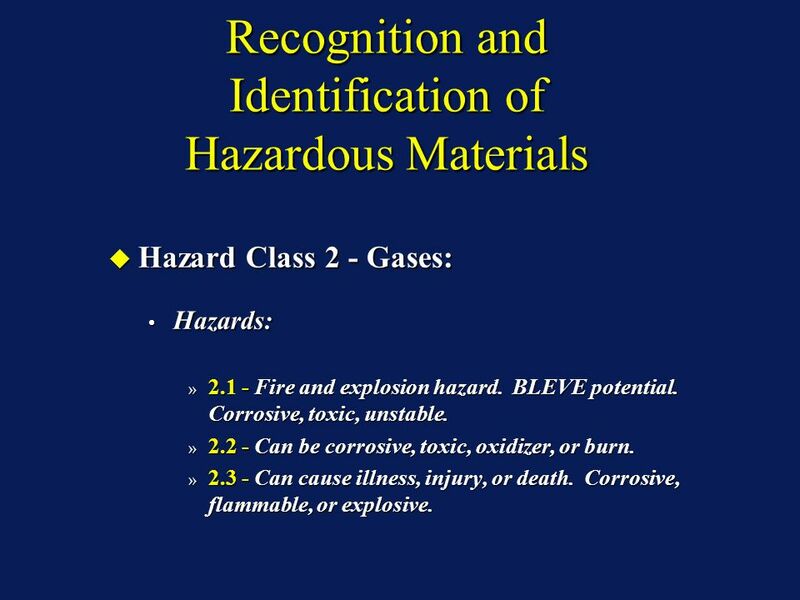 43 Recognition and Identification of Hazardous Materials Hazard Class 8: Corrosive Material: Hazard Class 8: Corrosive Material: Substances that cause visible destruction or irreversible alterations in human skin tissue or a liquid that has a severe corrosion rate on steel or aluminum. Substances that cause visible destruction or irreversible alterations in human skin tissue or a liquid that has a severe corrosion rate on steel or aluminum. Examples: Acetic Acid, Sulfuric Acid, Potassium Hydroxide, Nitric Acid. Examples: Acetic Acid, Sulfuric Acid, Potassium Hydroxide, Nitric Acid. 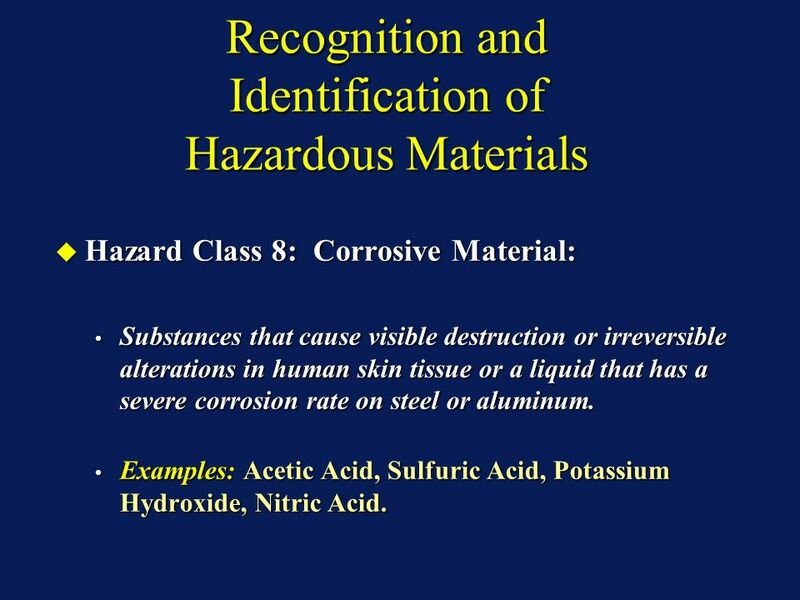 Hazard Class 8: Corrosive Material: Hazard Class 8: Corrosive Material: Substances that cause visible destruction or irreversible alterations in human skin tissue or a liquid that has a severe corrosion rate on steel or aluminum. Substances that cause visible destruction or irreversible alterations in human skin tissue or a liquid that has a severe corrosion rate on steel or aluminum. Examples: Acetic Acid, Sulfuric Acid, Potassium Hydroxide, Nitric Acid. Examples: Acetic Acid, Sulfuric Acid, Potassium Hydroxide, Nitric Acid. 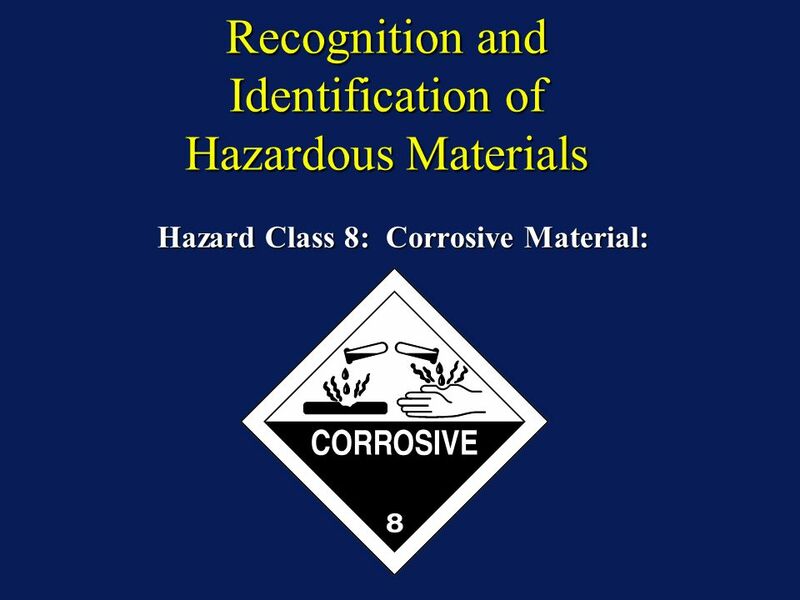 45 Recognition and Identification of Hazardous Materials Hazard Class 8: Corrosive Material: Hazard Class 8: Corrosive Material: Hazards:Hazards: » Severe chemical burns. » Respiratory distress. » Extensive tissue damage. » May be explosive, oxidizer, flammable, toxic, unstable, and/or water reactive. 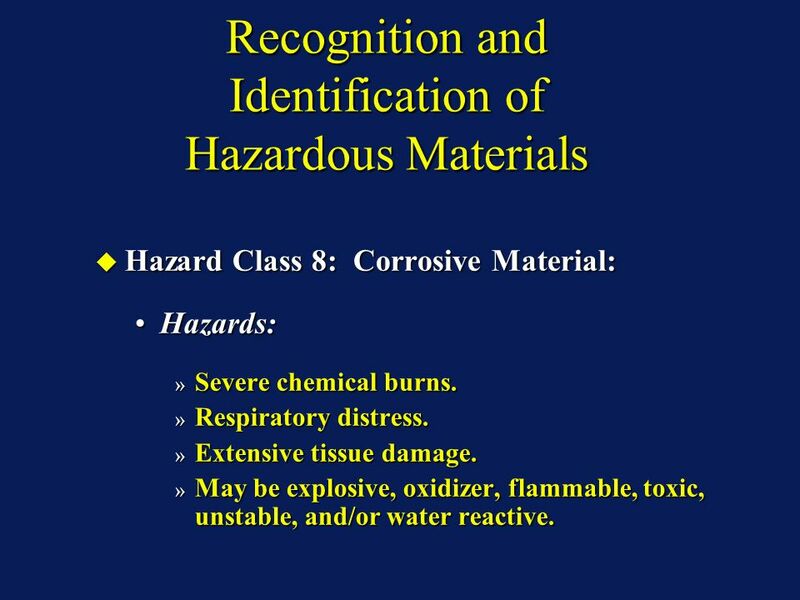 Hazard Class 8: Corrosive Material: Hazard Class 8: Corrosive Material: Hazards:Hazards: » Severe chemical burns. » Respiratory distress. » Extensive tissue damage. » May be explosive, oxidizer, flammable, toxic, unstable, and/or water reactive. 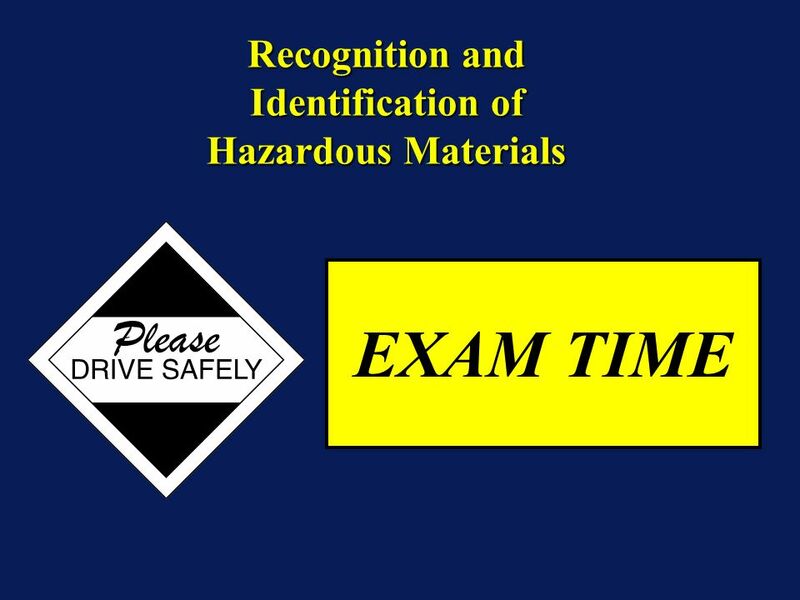 46 Recognition and Identification of Hazardous Materials Hazard Class 9: Miscellaneous Hazardous Materials: Hazard Class 9: Miscellaneous Hazardous Materials: A material which presents a hazard during transportation but which does not meet the definition of any other hazard class. 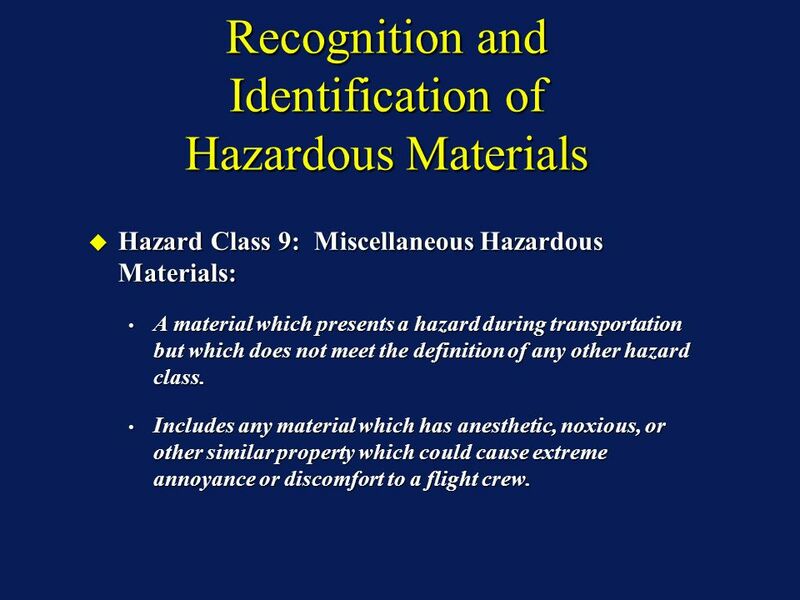 A material which presents a hazard during transportation but which does not meet the definition of any other hazard class. Includes any material which has anesthetic, noxious, or other similar property which could cause extreme annoyance or discomfort to a flight crew. Includes any material which has anesthetic, noxious, or other similar property which could cause extreme annoyance or discomfort to a flight crew. Hazard Class 9: Miscellaneous Hazardous Materials: Hazard Class 9: Miscellaneous Hazardous Materials: A material which presents a hazard during transportation but which does not meet the definition of any other hazard class. A material which presents a hazard during transportation but which does not meet the definition of any other hazard class. Includes any material which has anesthetic, noxious, or other similar property which could cause extreme annoyance or discomfort to a flight crew. Includes any material which has anesthetic, noxious, or other similar property which could cause extreme annoyance or discomfort to a flight crew. 48 Recognition and Identification of Hazardous Materials Hazard Class 9: Miscellaneous Hazardous Materials: Hazard Class 9: Miscellaneous Hazardous Materials: ORM-D - Any material such as a consumer commodity, which although otherwise subject to the regulations, presents a limited hazard during transportation due to its form, quantity, and packaging.ORM-D - Any material such as a consumer commodity, which although otherwise subject to the regulations, presents a limited hazard during transportation due to its form, quantity, and packaging. 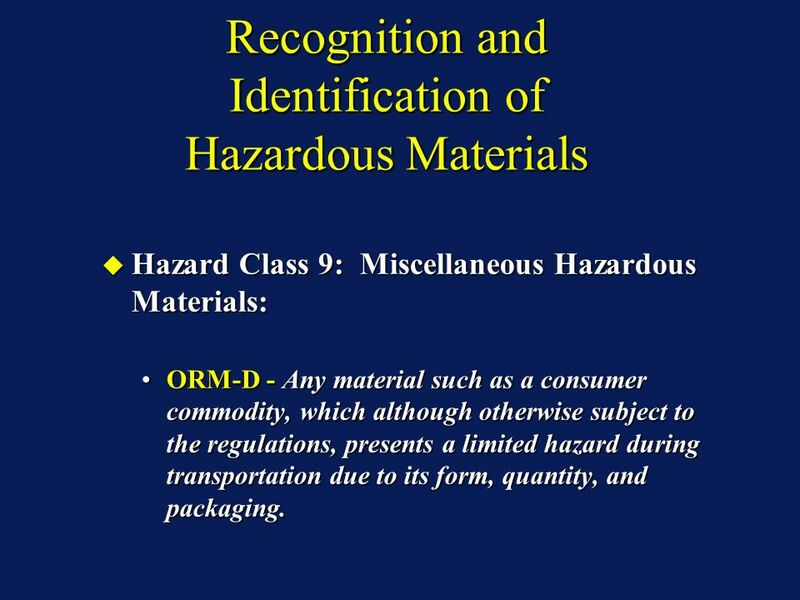 Hazard Class 9: Miscellaneous Hazardous Materials: Hazard Class 9: Miscellaneous Hazardous Materials: ORM-D - Any material such as a consumer commodity, which although otherwise subject to the regulations, presents a limited hazard during transportation due to its form, quantity, and packaging.ORM-D - Any material such as a consumer commodity, which although otherwise subject to the regulations, presents a limited hazard during transportation due to its form, quantity, and packaging. 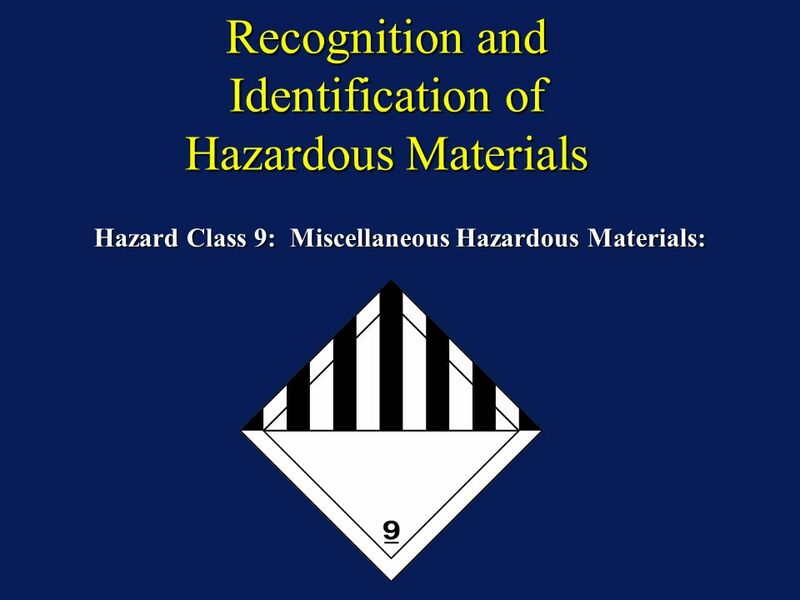 49 Recognition and Identification of Hazardous Materials Hazard Class 9: Miscellaneous Hazardous Materials: Hazard Class 9: Miscellaneous Hazardous Materials: Examples: Examples: » PCBs. » Lithium batteries. » Butane filled cigarette lighters. » Some hazardous wastes (e.g., those that have failed TCLP). Hazard Class 9: Miscellaneous Hazardous Materials: Hazard Class 9: Miscellaneous Hazardous Materials: Examples: Examples: » PCBs. » Lithium batteries. » Butane filled cigarette lighters. 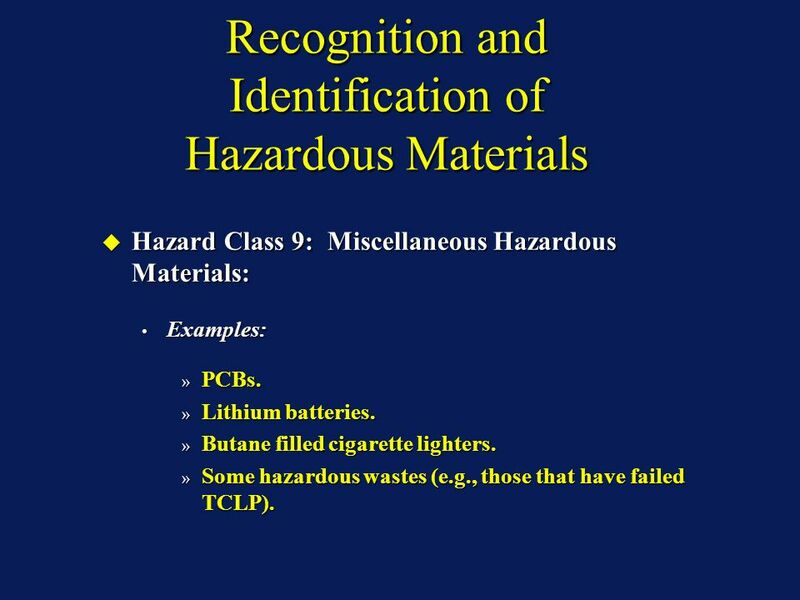 » Some hazardous wastes (e.g., those that have failed TCLP). 50 Recognition and Identification of Hazardous Materials Hazard Class 9: Miscellaneous Hazardous Materials: Hazard Class 9: Miscellaneous Hazardous Materials: Even small quantities of Class 9 materials, e.g., nail polish, can present a danger to emergency responders. 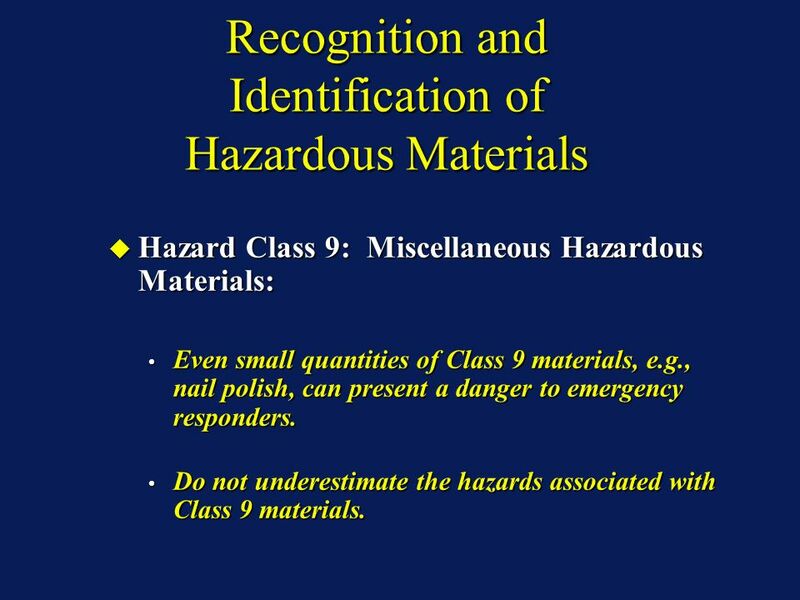 Even small quantities of Class 9 materials, e.g., nail polish, can present a danger to emergency responders. Do not underestimate the hazards associated with Class 9 materials. Do not underestimate the hazards associated with Class 9 materials. Hazard Class 9: Miscellaneous Hazardous Materials: Hazard Class 9: Miscellaneous Hazardous Materials: Even small quantities of Class 9 materials, e.g., nail polish, can present a danger to emergency responders. Even small quantities of Class 9 materials, e.g., nail polish, can present a danger to emergency responders. Do not underestimate the hazards associated with Class 9 materials. Do not underestimate the hazards associated with Class 9 materials. 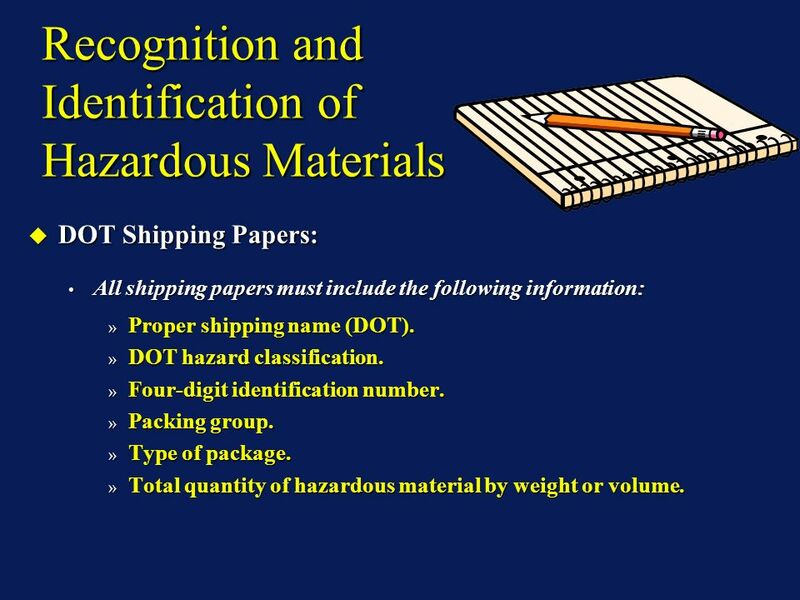 52 Recognition and Identification of Hazardous Materials DOT Shipping Papers: DOT Shipping Papers: Some commodities may require additional shipping papers: Some commodities may require additional shipping papers: » EPA hazardous substances must be denoted on shipping papers with RQ (reportable quantity). » Any release to the environment above an RQ must be reported to the National Response Center (NRC). » 40 CFR 302.4 contains the EPA listing of hazardous substances and their RQ. 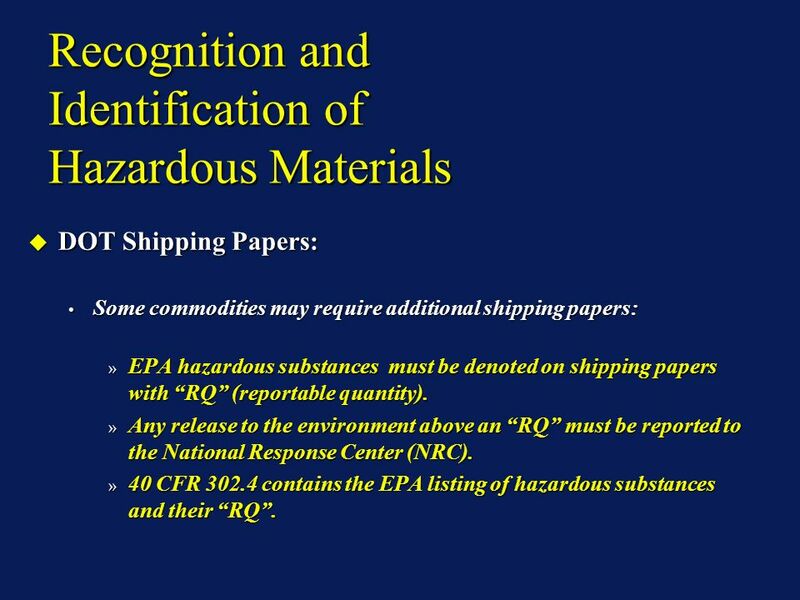 DOT Shipping Papers: DOT Shipping Papers: Some commodities may require additional shipping papers: Some commodities may require additional shipping papers: » EPA hazardous substances must be denoted on shipping papers with RQ (reportable quantity). » Any release to the environment above an RQ must be reported to the National Response Center (NRC). » 40 CFR 302.4 contains the EPA listing of hazardous substances and their RQ. 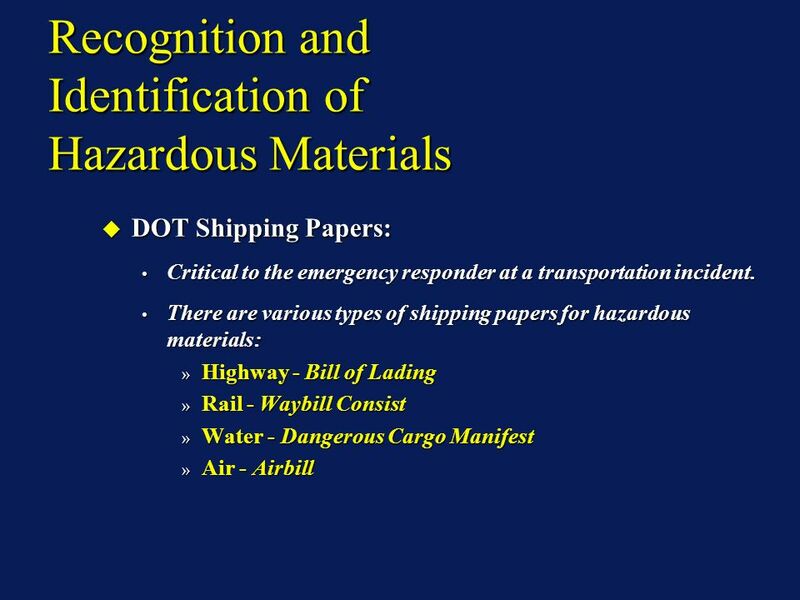 53 Recognition and Identification of Hazardous Materials DOT Shipping Papers: DOT Shipping Papers: The location for each shipping paper and the individual responsible for each shipping paper is dependent on the mode of transportation. The location for each shipping paper and the individual responsible for each shipping paper is dependent on the mode of transportation. Highway - Driver - Cab of Vehicle: Highway - Driver - Cab of Vehicle: » Rail - Crew - With Crew. » Water - Captain or Master - Wheel House/Pipelike Container on a Barge. » Air - Pilot - Cockpit. See SM Table 7-5. See SM Table 7-5. DOT Shipping Papers: DOT Shipping Papers: The location for each shipping paper and the individual responsible for each shipping paper is dependent on the mode of transportation. The location for each shipping paper and the individual responsible for each shipping paper is dependent on the mode of transportation. Highway - Driver - Cab of Vehicle: Highway - Driver - Cab of Vehicle: » Rail - Crew - With Crew. » Water - Captain or Master - Wheel House/Pipelike Container on a Barge. » Air - Pilot - Cockpit. See SM Table 7-5. See SM Table 7-5. 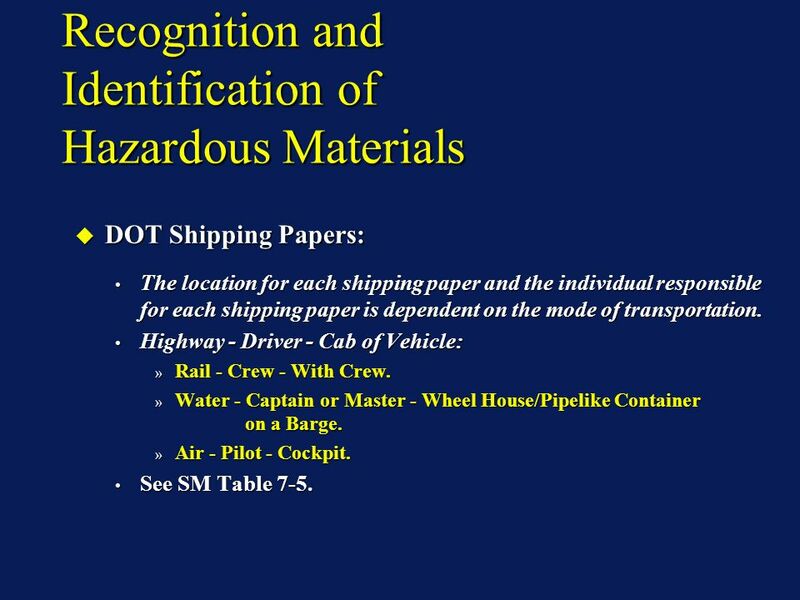 54 Recognition and Identification of Hazardous Materials DOT Shipping Papers: DOT Shipping Papers: All shipping papers must include the following information: All shipping papers must include the following information: » Proper shipping name (DOT). 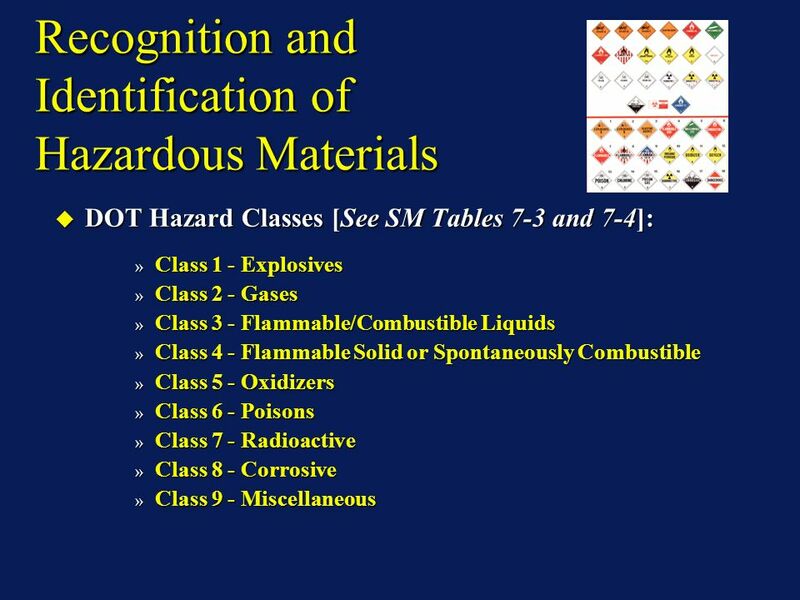 » DOT hazard classification. » Four-digit identification number. » Packing group. » Type of package. » Total quantity of hazardous material by weight or volume. DOT Shipping Papers: DOT Shipping Papers: All shipping papers must include the following information: All shipping papers must include the following information: » Proper shipping name (DOT). » DOT hazard classification. » Four-digit identification number. » Packing group. » Type of package. » Total quantity of hazardous material by weight or volume. 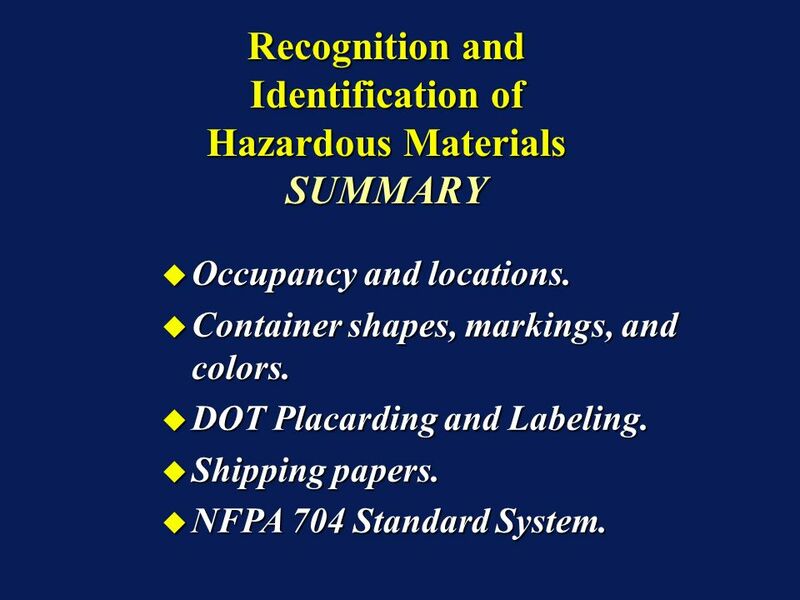 55 Recognition and Identification of Hazardous Materials NFPA 704 Standard for Identification of the Fire Hazards of Materials: NFPA 704 Standard for Identification of the Fire Hazards of Materials: Displays: Displays: » General hazards. » Degree of severity of toxicity. » Flammability. » Reactivity. » Special information. 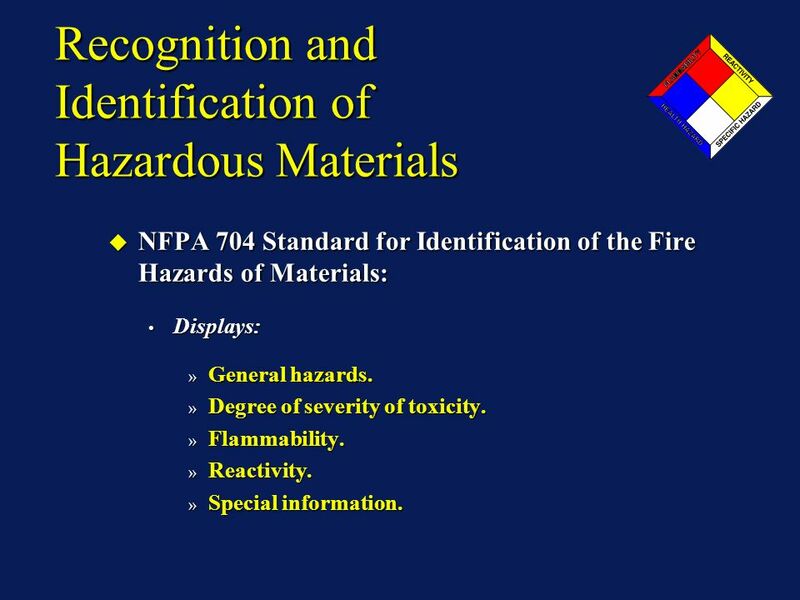 NFPA 704 Standard for Identification of the Fire Hazards of Materials: NFPA 704 Standard for Identification of the Fire Hazards of Materials: Displays: Displays: » General hazards. » Degree of severity of toxicity. » Flammability. » Reactivity. » Special information. 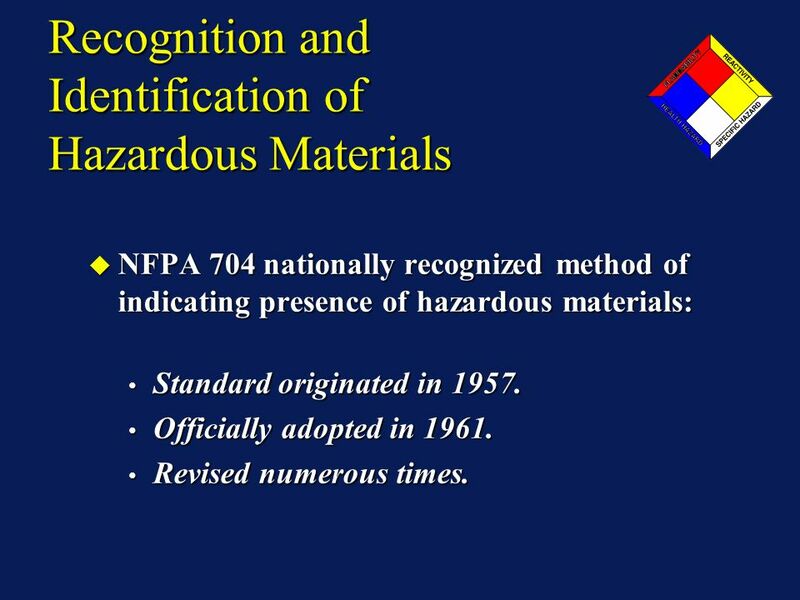 56 Recognition and Identification of Hazardous Materials NFPA 704 nationally recognized method of indicating presence of hazardous materials: NFPA 704 nationally recognized method of indicating presence of hazardous materials: Standard originated in 1957. Standard originated in 1957. Officially adopted in 1961. Officially adopted in 1961. Revised numerous times. Revised numerous times. NFPA 704 nationally recognized method of indicating presence of hazardous materials: NFPA 704 nationally recognized method of indicating presence of hazardous materials: Standard originated in 1957. Standard originated in 1957. Officially adopted in 1961. Officially adopted in 1961. Revised numerous times. Revised numerous times. 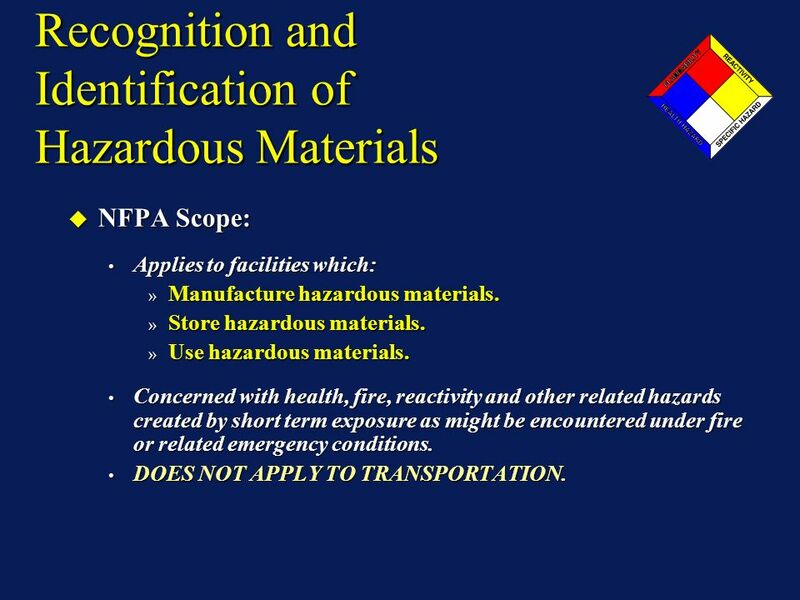 57 Recognition and Identification of Hazardous Materials NFPA Scope: NFPA Scope: Applies to facilities which: Applies to facilities which: » Manufacture hazardous materials. » Store hazardous materials. » Use hazardous materials. Concerned with health, fire, reactivity and other related hazards created by short term exposure as might be encountered under fire or related emergency conditions. Concerned with health, fire, reactivity and other related hazards created by short term exposure as might be encountered under fire or related emergency conditions. 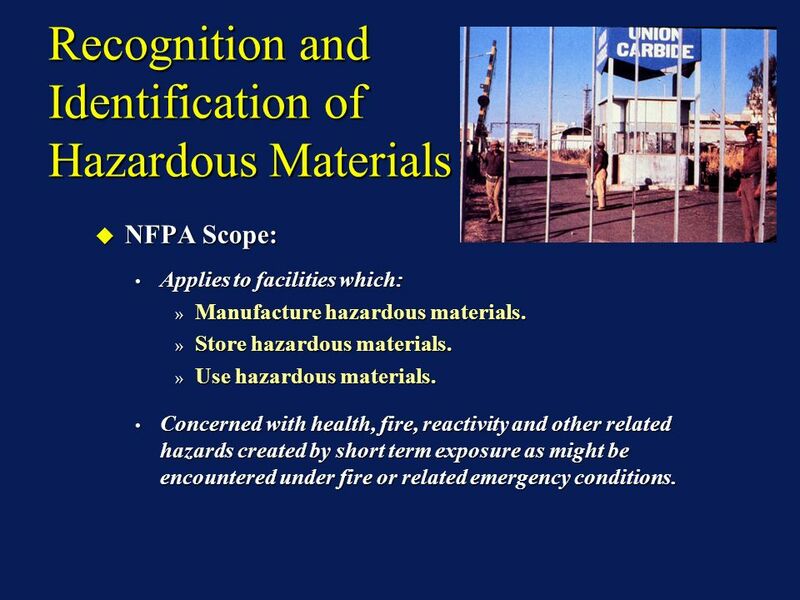 58 Recognition and Identification of Hazardous Materials NFPA Scope: NFPA Scope: Applies to facilities which: Applies to facilities which: » Manufacture hazardous materials. » Store hazardous materials. » Use hazardous materials. Concerned with health, fire, reactivity and other related hazards created by short term exposure as might be encountered under fire or related emergency conditions. Concerned with health, fire, reactivity and other related hazards created by short term exposure as might be encountered under fire or related emergency conditions. DOES NOT APPLY TO TRANSPORTATION. DOES NOT APPLY TO TRANSPORTATION. 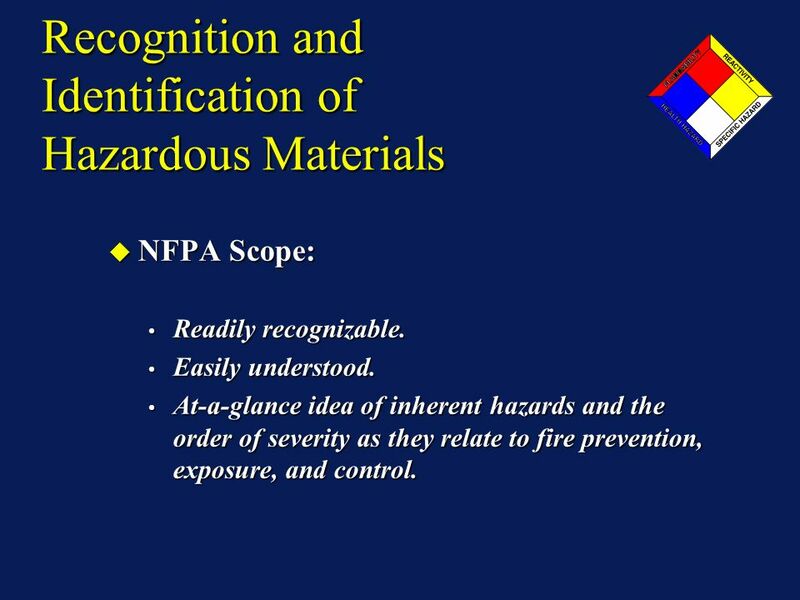 NFPA Scope: NFPA Scope: Applies to facilities which: Applies to facilities which: » Manufacture hazardous materials. » Store hazardous materials. » Use hazardous materials. Concerned with health, fire, reactivity and other related hazards created by short term exposure as might be encountered under fire or related emergency conditions. Concerned with health, fire, reactivity and other related hazards created by short term exposure as might be encountered under fire or related emergency conditions. DOES NOT APPLY TO TRANSPORTATION. DOES NOT APPLY TO TRANSPORTATION. 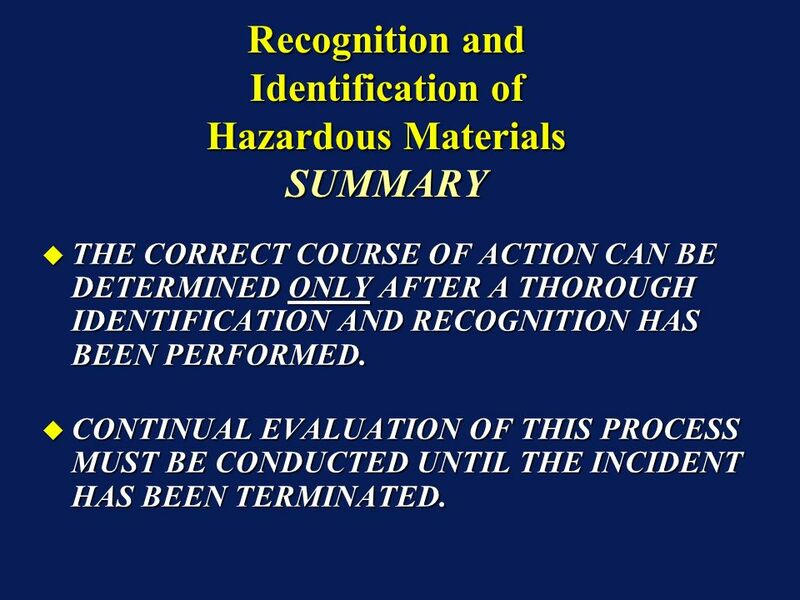 59 Recognition and Identification of Hazardous Materials NFPA Scope: NFPA Scope: Readily recognizable. Readily recognizable. Easily understood. Easily understood. At-a-glance idea of inherent hazards and the order of severity as they relate to fire prevention, exposure, and control. At-a-glance idea of inherent hazards and the order of severity as they relate to fire prevention, exposure, and control. NFPA Scope: NFPA Scope: Readily recognizable. Readily recognizable. Easily understood. Easily understood. At-a-glance idea of inherent hazards and the order of severity as they relate to fire prevention, exposure, and control. At-a-glance idea of inherent hazards and the order of severity as they relate to fire prevention, exposure, and control. 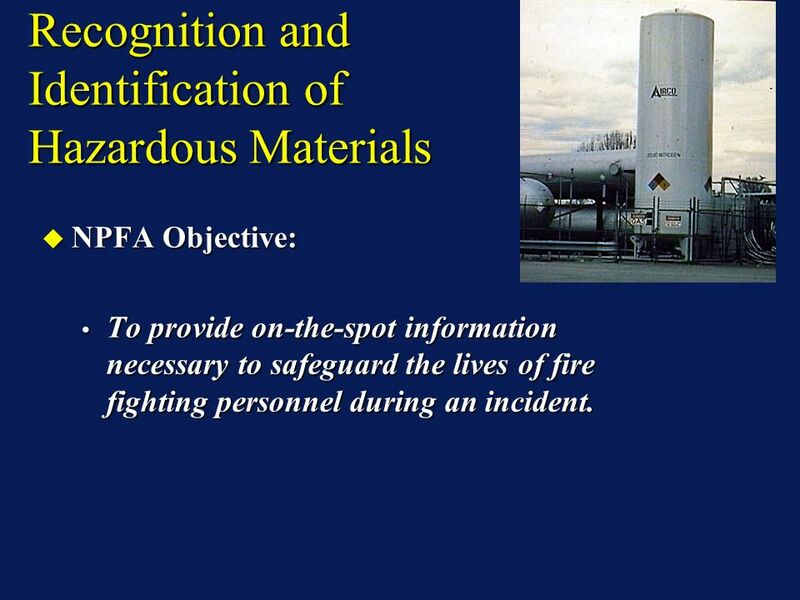 60 Recognition and Identification of Hazardous Materials NPFA Objective: NPFA Objective: To provide on-the-spot information necessary to safeguard the lives of fire fighting personnel during an incident. To provide on-the-spot information necessary to safeguard the lives of fire fighting personnel during an incident. NPFA Objective: NPFA Objective: To provide on-the-spot information necessary to safeguard the lives of fire fighting personnel during an incident. To provide on-the-spot information necessary to safeguard the lives of fire fighting personnel during an incident. 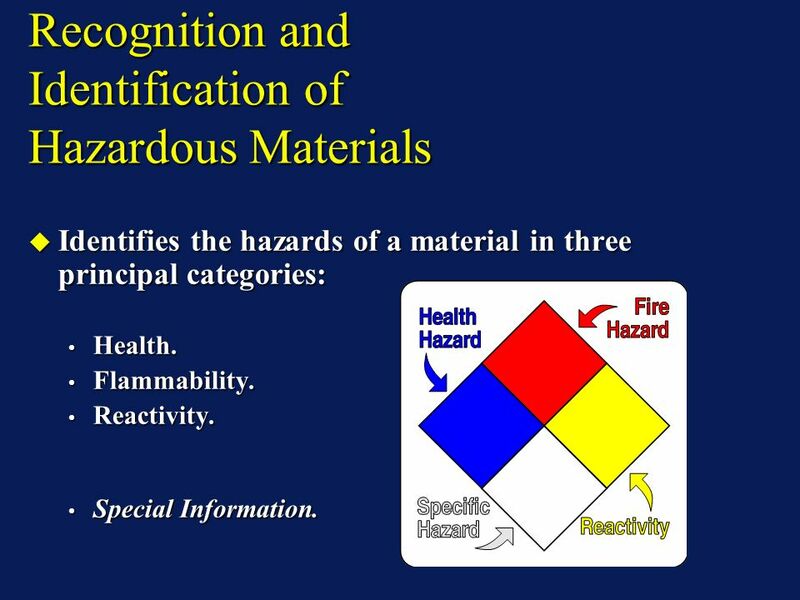 61 Recognition and Identification of Hazardous Materials Identifies the hazards of a material in three principal categories: Identifies the hazards of a material in three principal categories: Health. Health. Flammability. Flammability. Reactivity. Reactivity. Special Information. Special Information. Identifies the hazards of a material in three principal categories: Identifies the hazards of a material in three principal categories: Health. Health. Flammability. Flammability. Reactivity. Reactivity. Special Information. Special Information. 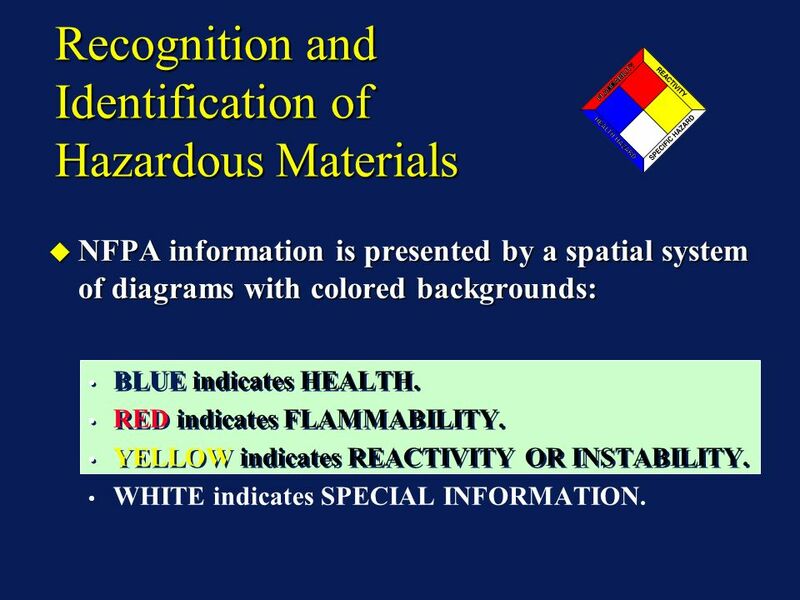 63 Recognition and Identification of Hazardous Materials NFPA information is presented by a spatial system of diagrams with colored backgrounds: NFPA information is presented by a spatial system of diagrams with colored backgrounds: BLUE indicates HEALTH. RED indicates FLAMMABILITY. YELLOW indicates REACTIVITY OR INSTABILITY. WHITE indicates SPECIAL INFORMATION. NFPA information is presented by a spatial system of diagrams with colored backgrounds: NFPA information is presented by a spatial system of diagrams with colored backgrounds: BLUE indicates HEALTH. RED indicates FLAMMABILITY. YELLOW indicates REACTIVITY OR INSTABILITY. WHITE indicates SPECIAL INFORMATION. 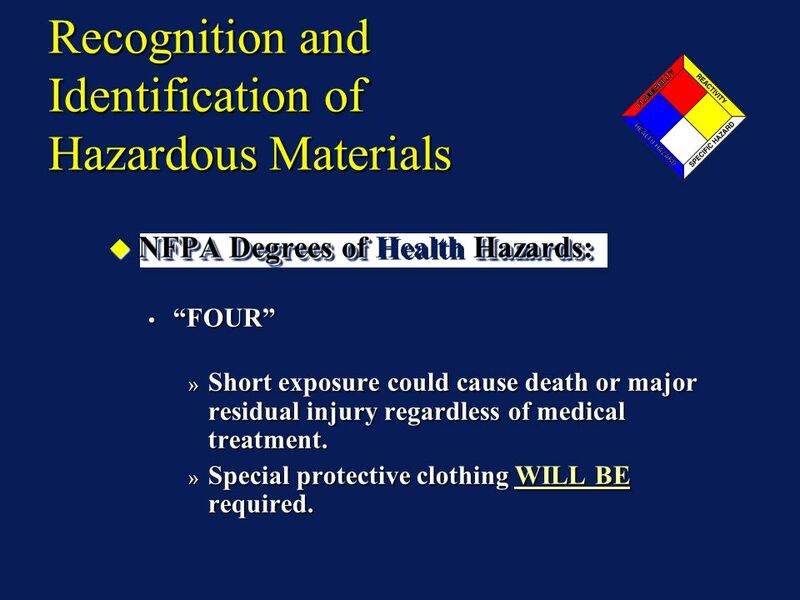 65 NFPA Degrees of Hazards: NFPA Degrees of Health Hazards: FOUR FOUR » Short exposure could cause death or major residual injury regardless of medical treatment. » Special protective clothing WILL BE required. NFPA Degrees of Hazards: NFPA Degrees of Health Hazards: FOUR FOUR » Short exposure could cause death or major residual injury regardless of medical treatment. » Special protective clothing WILL BE required. 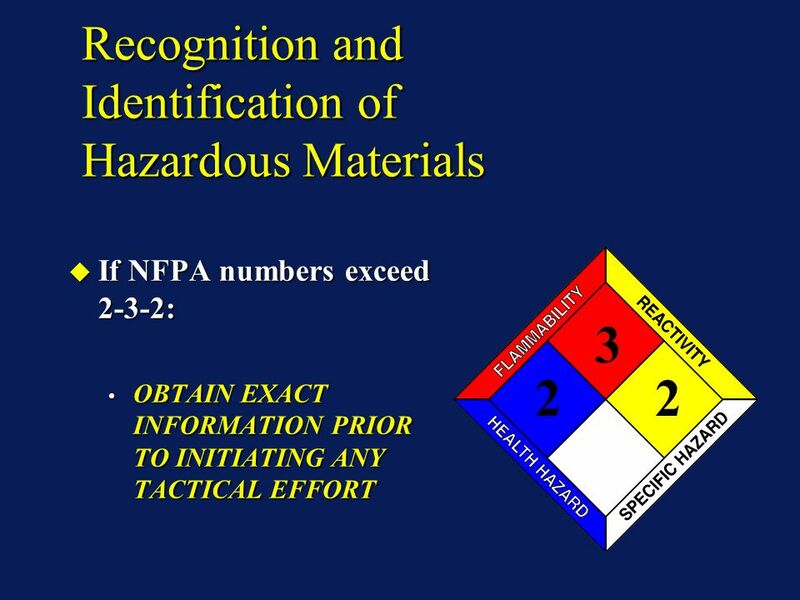 66 Recognition and Identification of Hazardous Materials NFPA Degrees of Hazards: NFPA Degrees of Health Hazards: THREE THREE » Short exposure could cause serious temporary or residual injury - even with prompt medical treatment. » NO skin surface exposed. » Full firefighters PPE required - SCBA, wrist and pant legs banded. 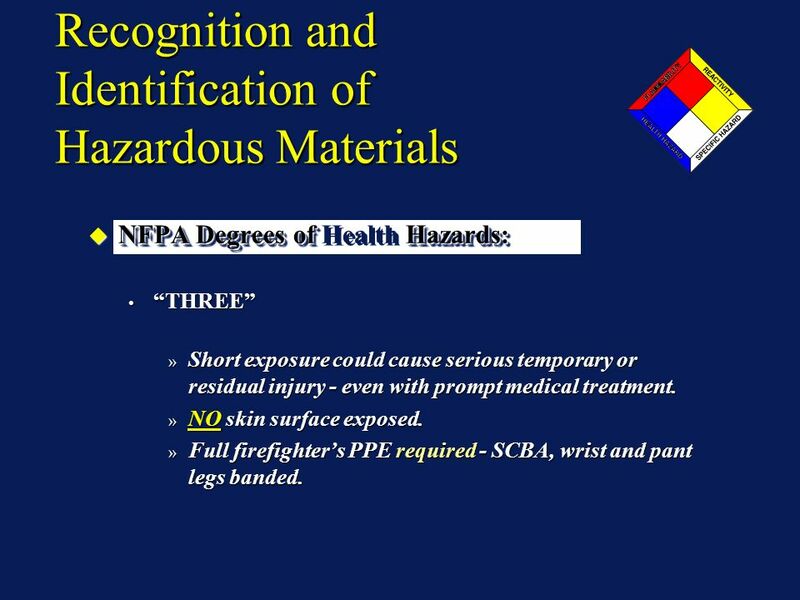 NFPA Degrees of Hazards: NFPA Degrees of Health Hazards: THREE THREE » Short exposure could cause serious temporary or residual injury - even with prompt medical treatment. » NO skin surface exposed. » Full firefighters PPE required - SCBA, wrist and pant legs banded. 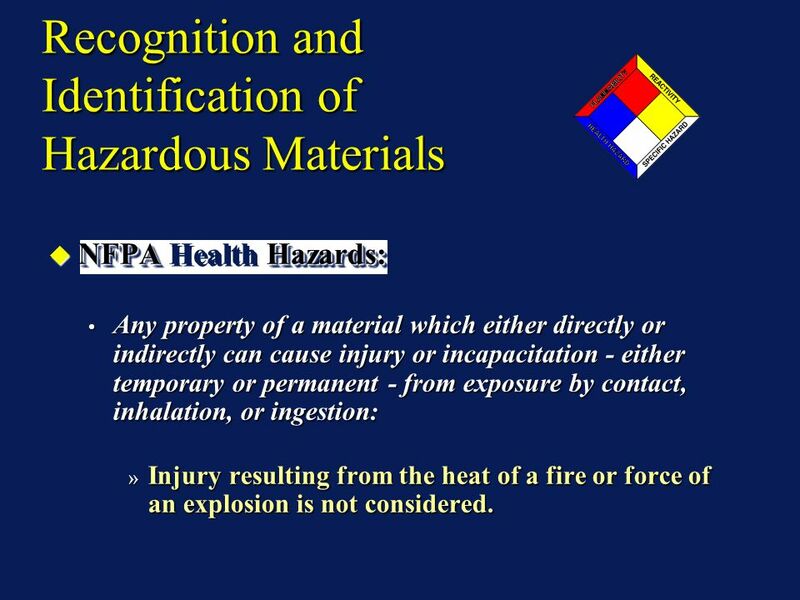 67 Recognition and Identification of Hazardous Materials NFPA Degrees of Hazards: NFPA Degrees of Health Hazards: TWO TWO » Intense or continued exposure could cause temporary incapacitation or residual injury. » Full firefighters PPE and SCBA. 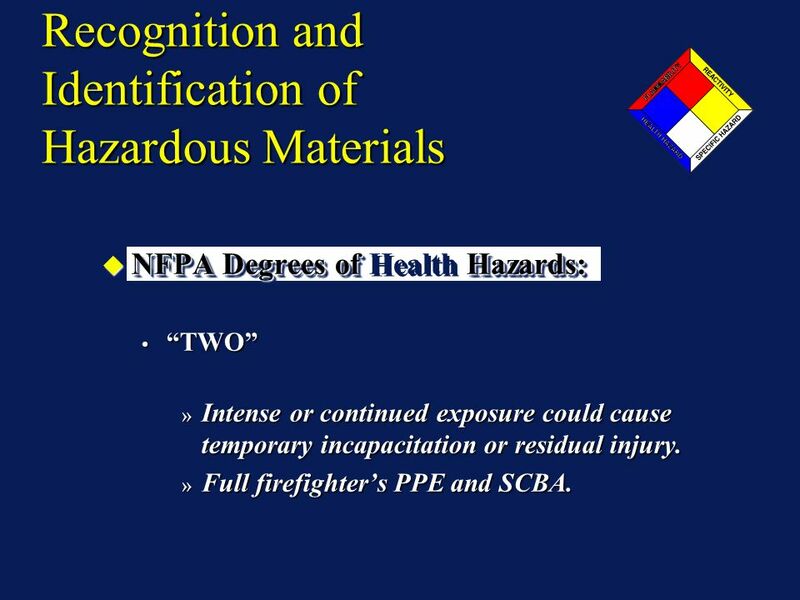 NFPA Degrees of Hazards: NFPA Degrees of Health Hazards: TWO TWO » Intense or continued exposure could cause temporary incapacitation or residual injury. » Full firefighters PPE and SCBA. 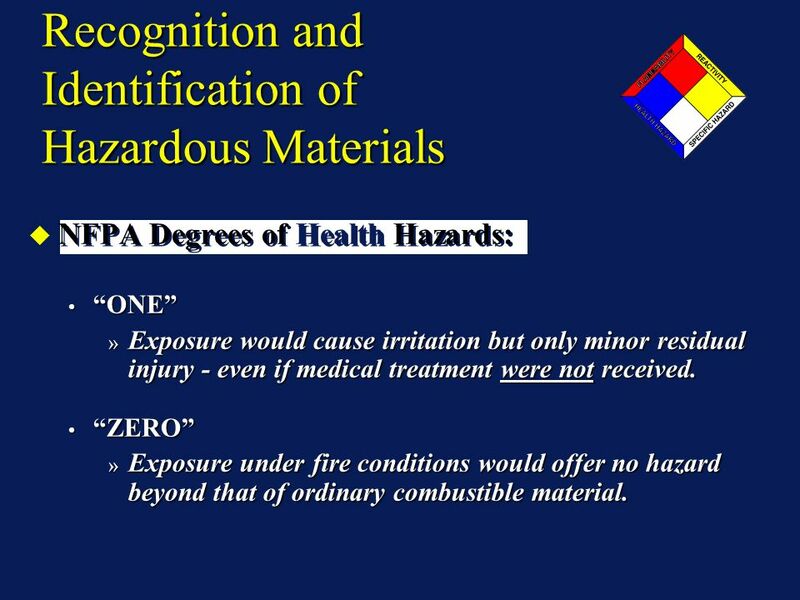 68 Recognition and Identification of Hazardous Materials NFPA Degrees of Health Hazards: ONE ONE » Exposure would cause irritation but only minor residual injury - even if medical treatment were not received. ZERO ZERO » Exposure under fire conditions would offer no hazard beyond that of ordinary combustible material. NFPA Degrees of Health Hazards: ONE ONE » Exposure would cause irritation but only minor residual injury - even if medical treatment were not received. ZERO ZERO » Exposure under fire conditions would offer no hazard beyond that of ordinary combustible material. 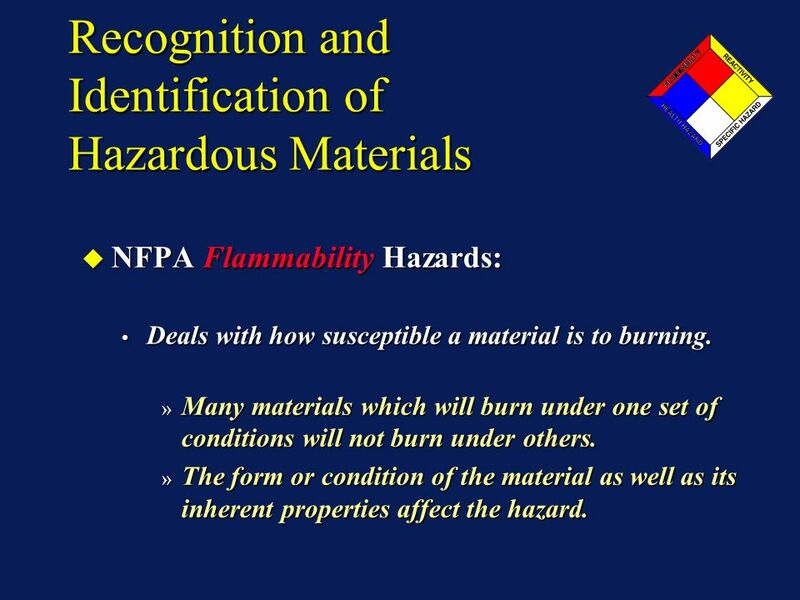 69 Recognition and Identification of Hazardous Materials NFPA Flammability Hazards: NFPA Flammability Hazards: Deals with how susceptible a material is to burning. Deals with how susceptible a material is to burning. » Many materials which will burn under one set of conditions will not burn under others. » The form or condition of the material as well as its inherent properties affect the hazard. NFPA Flammability Hazards: NFPA Flammability Hazards: Deals with how susceptible a material is to burning. Deals with how susceptible a material is to burning. » Many materials which will burn under one set of conditions will not burn under others. » The form or condition of the material as well as its inherent properties affect the hazard. 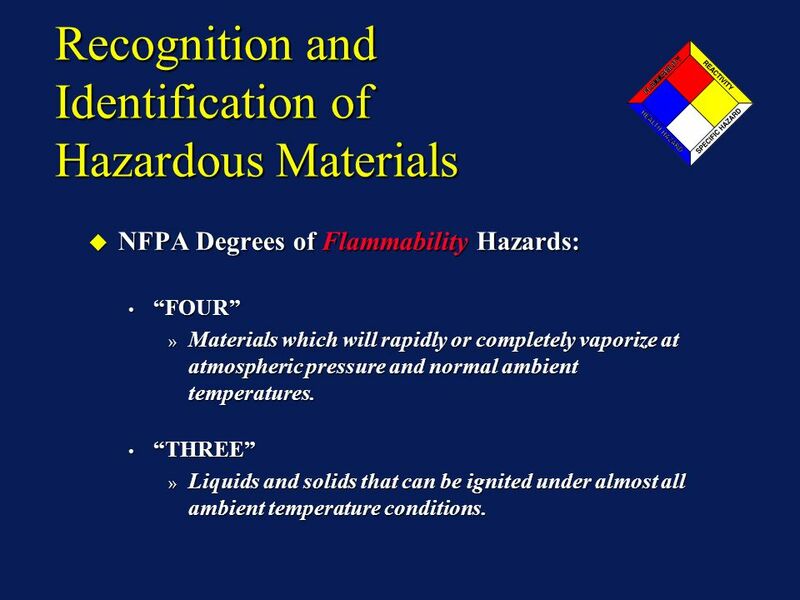 70 Recognition and Identification of Hazardous Materials NFPA Degrees of Flammability Hazards: NFPA Degrees of Flammability Hazards: FOUR FOUR » Materials which will rapidly or completely vaporize at atmospheric pressure and normal ambient temperatures. THREE THREE » Liquids and solids that can be ignited under almost all ambient temperature conditions. NFPA Degrees of Flammability Hazards: NFPA Degrees of Flammability Hazards: FOUR FOUR » Materials which will rapidly or completely vaporize at atmospheric pressure and normal ambient temperatures. THREE THREE » Liquids and solids that can be ignited under almost all ambient temperature conditions. 71 Recognition and Identification of Hazardous Recognition and Identification of Hazardous Materials NFPA Degrees of Flammability Hazards: NFPA Degrees of Flammability Hazards: TWO TWO » Materials which must be moderately heated or exposed to relatively high ambient temperatures before ignition can occur. ONE ONE » Materials that must be preheated before ignition can occur. ZERO ZERO » Materials that will not burn when exposed to a temperature of 1500 o F. NFPA Degrees of Flammability Hazards: NFPA Degrees of Flammability Hazards: TWO TWO » Materials which must be moderately heated or exposed to relatively high ambient temperatures before ignition can occur. ONE ONE » Materials that must be preheated before ignition can occur. ZERO ZERO » Materials that will not burn when exposed to a temperature of 1500 o F.
72 Recognition and Identification of Hazardous Materials NFPA Reactivity (Instability) Hazards: NFPA Reactivity (Instability) Hazards: Deals with the degree of susceptibility of materials to release energy: Deals with the degree of susceptibility of materials to release energy: » Some materials are capable of rapid release of energy by themselves, as by self-reaction or polymerization, or can undergo violent eruptive or explosive reaction if contacted with water or other extinguishing agents or with certain other materials. NFPA Reactivity (Instability) Hazards: NFPA Reactivity (Instability) Hazards: Deals with the degree of susceptibility of materials to release energy: Deals with the degree of susceptibility of materials to release energy: » Some materials are capable of rapid release of energy by themselves, as by self-reaction or polymerization, or can undergo violent eruptive or explosive reaction if contacted with water or other extinguishing agents or with certain other materials. 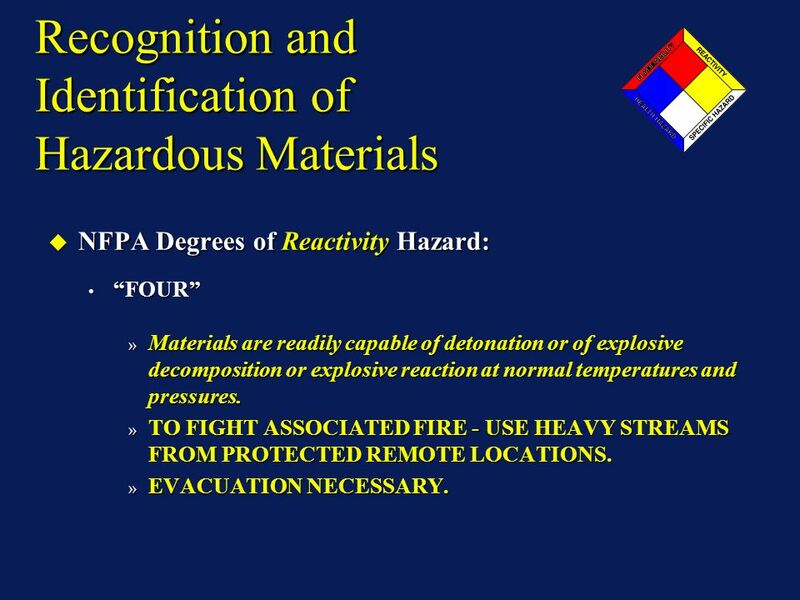 73 Recognition and Identification of Hazardous Materials NFPA Degrees of Reactivity Hazard: NFPA Degrees of Reactivity Hazard: FOUR FOUR » Materials are readily capable of detonation or of explosive decomposition or explosive reaction at normal temperatures and pressures. » TO FIGHT ASSOCIATED FIRE - USE HEAVY STREAMS FROM PROTECTED REMOTE LOCATIONS. » EVACUATION NECESSARY. NFPA Degrees of Reactivity Hazard: NFPA Degrees of Reactivity Hazard: FOUR FOUR » Materials are readily capable of detonation or of explosive decomposition or explosive reaction at normal temperatures and pressures. » TO FIGHT ASSOCIATED FIRE - USE HEAVY STREAMS FROM PROTECTED REMOTE LOCATIONS. » EVACUATION NECESSARY. 74 Recognition and Identification of Hazardous Materials NFPA Degrees of Reactivity Hazard: NFPA Degrees of Reactivity Hazard: THREE THREE » Materials are capable of detonation or of explosive decomposition or explosive reaction but require a strong initiating force or must be heated under confinement before initiation. » FIGHT FIRES FROM AN EXPLOSION RESISTANT LOCATIONS. 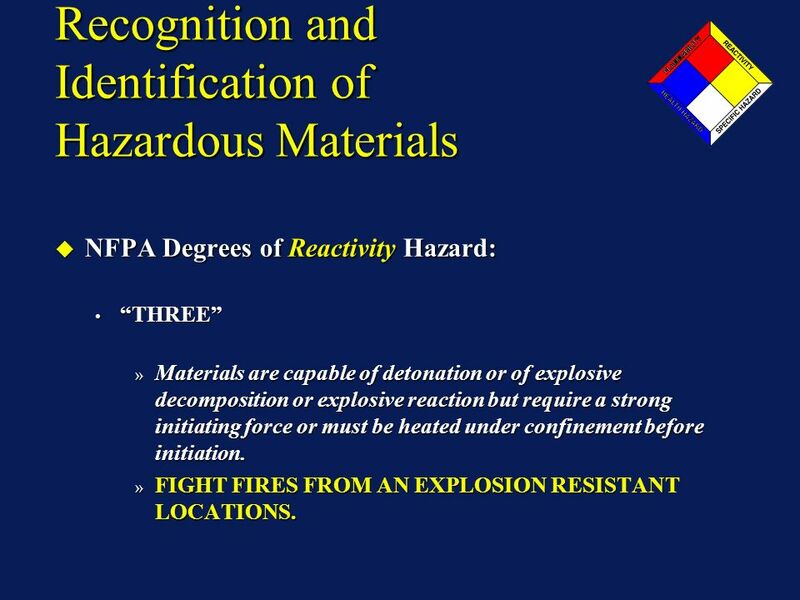 NFPA Degrees of Reactivity Hazard: NFPA Degrees of Reactivity Hazard: THREE THREE » Materials are capable of detonation or of explosive decomposition or explosive reaction but require a strong initiating force or must be heated under confinement before initiation. » FIGHT FIRES FROM AN EXPLOSION RESISTANT LOCATIONS. 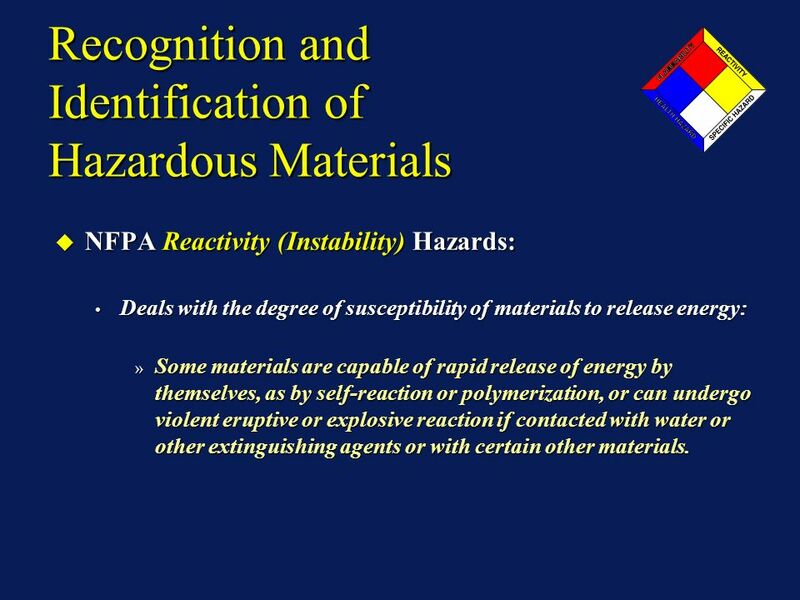 75 Recognition and Identification of Hazardous Materials NFPA Degrees of Reactivity Hazard: NFPA Degrees of Reactivity Hazard: TWO TWO » Materials which are normally unstable and readily undergo violent chemical change but do not detonate. » FIGHT FIRES FROM A SAFE AND PROTECTED LOCATION. 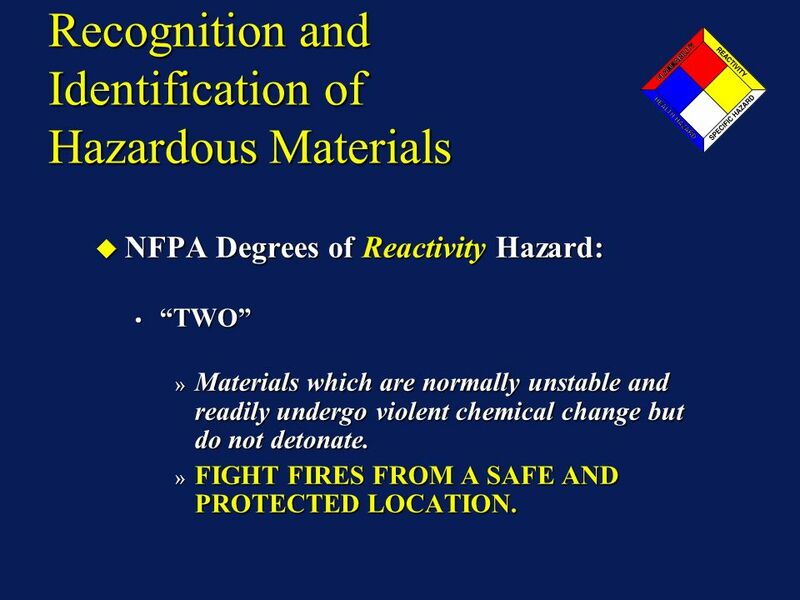 NFPA Degrees of Reactivity Hazard: NFPA Degrees of Reactivity Hazard: TWO TWO » Materials which are normally unstable and readily undergo violent chemical change but do not detonate. » FIGHT FIRES FROM A SAFE AND PROTECTED LOCATION. 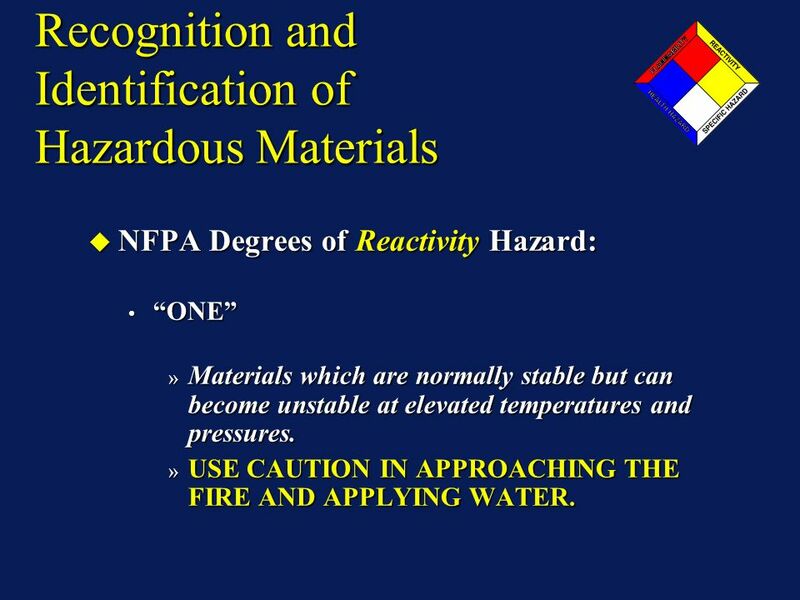 76 Recognition and Identification of Hazardous Materials NFPA Degrees of Reactivity Hazard: NFPA Degrees of Reactivity Hazard: ONE ONE » Materials which are normally stable but can become unstable at elevated temperatures and pressures. » USE CAUTION IN APPROACHING THE FIRE AND APPLYING WATER. NFPA Degrees of Reactivity Hazard: NFPA Degrees of Reactivity Hazard: ONE ONE » Materials which are normally stable but can become unstable at elevated temperatures and pressures. » USE CAUTION IN APPROACHING THE FIRE AND APPLYING WATER. 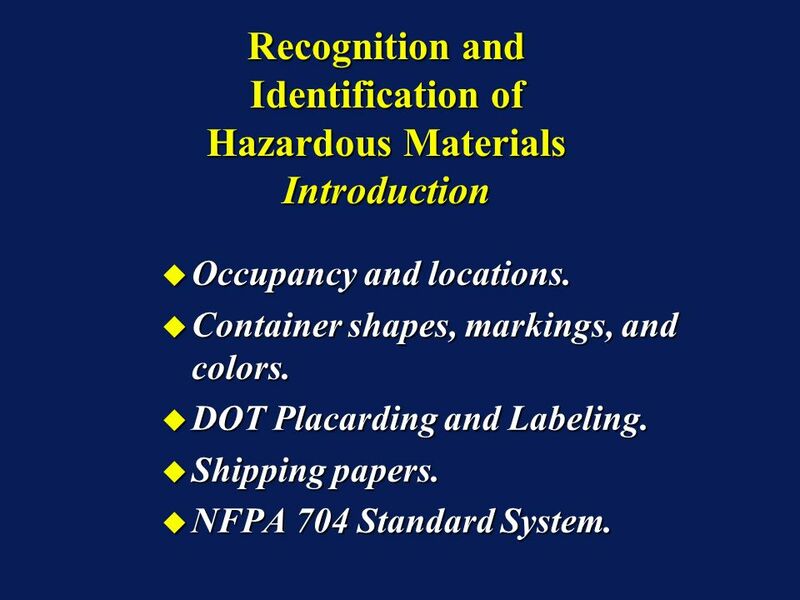 77 Recognition and Identification of Hazardous Materials NFPA Degrees of Reactivity Hazard: NFPA Degrees of Reactivity Hazard: ZERO ZERO » Materials which are normally stable, even under fire conditions. 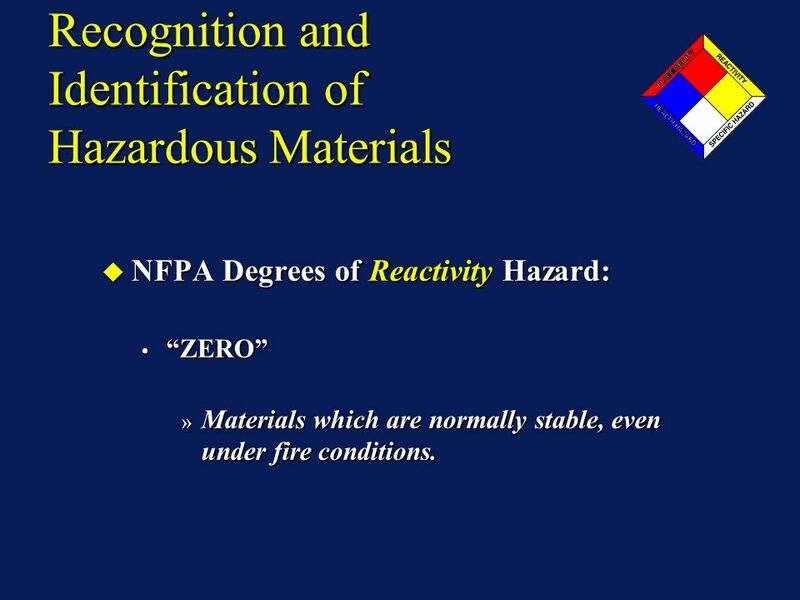 NFPA Degrees of Reactivity Hazard: NFPA Degrees of Reactivity Hazard: ZERO ZERO » Materials which are normally stable, even under fire conditions. 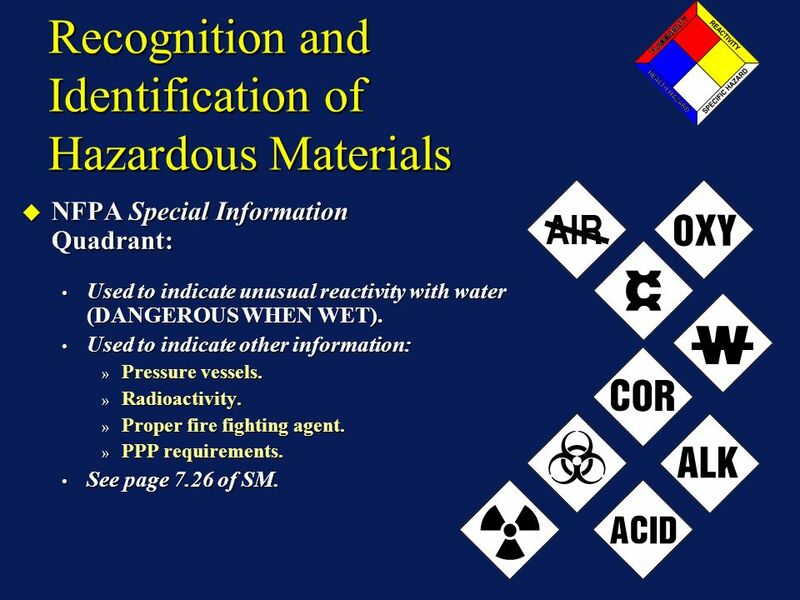 78 Recognition and Identification of Hazardous Materials NFPA Special Information Quadrant: NFPA Special Information Quadrant: Used to indicate unusual reactivity with water (DANGEROUS WHEN WET). Used to indicate unusual reactivity with water (DANGEROUS WHEN WET). Used to indicate other information: Used to indicate other information: » Pressure vessels. » Radioactivity. » Proper fire fighting agent. » PPP requirements. See page 7.26 of SM. See page 7.26 of SM. NFPA Special Information Quadrant: NFPA Special Information Quadrant: Used to indicate unusual reactivity with water (DANGEROUS WHEN WET). Used to indicate unusual reactivity with water (DANGEROUS WHEN WET). Used to indicate other information: Used to indicate other information: » Pressure vessels. » Radioactivity. » Proper fire fighting agent. » PPP requirements. See page 7.26 of SM. See page 7.26 of SM. 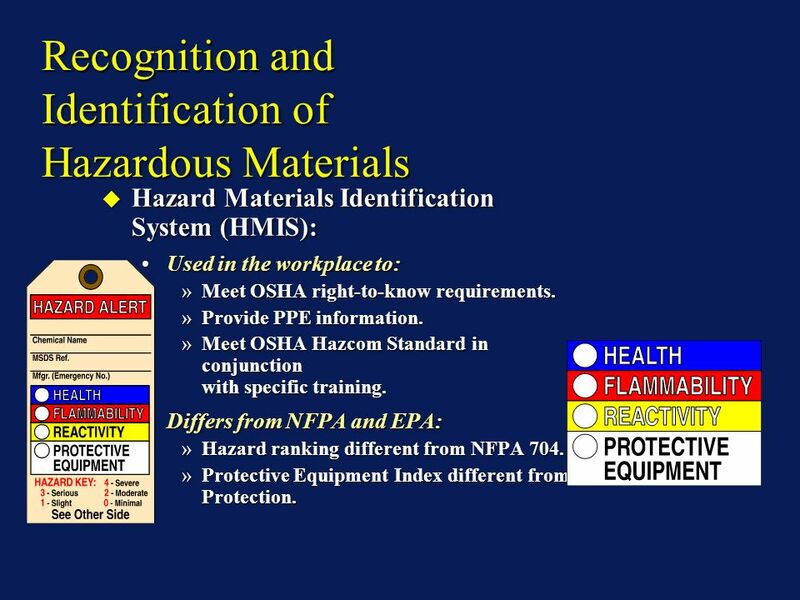 79 Recognition and Identification of Hazardous Materials NFPA System Deficiencies: NFPA System Deficiencies: NFPA placards do not indicate: NFPA placards do not indicate: » Name of material. » Quantity of material. » Location of material within the building. NFPA placards may be obscured. NFPA placards may be obscured. » At night. » By smoke. » By fog. 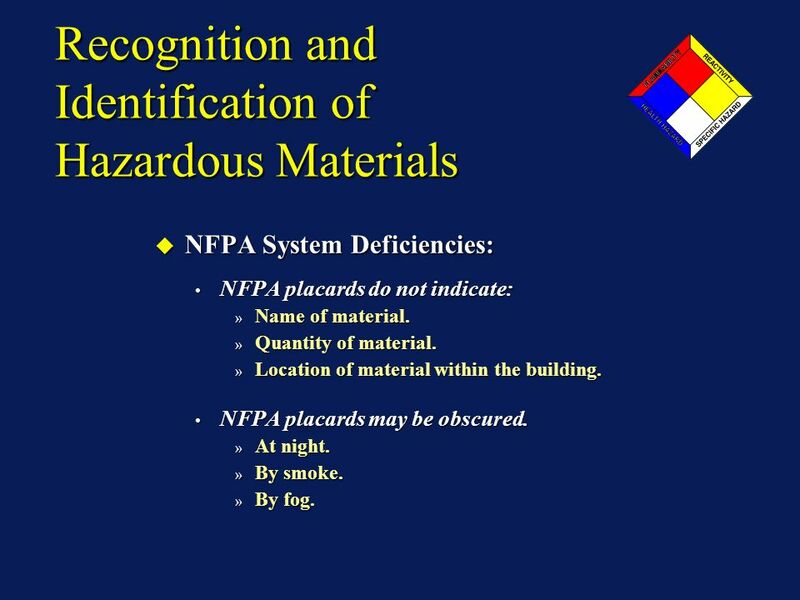 NFPA System Deficiencies: NFPA System Deficiencies: NFPA placards do not indicate: NFPA placards do not indicate: » Name of material. » Quantity of material. » Location of material within the building. NFPA placards may be obscured. NFPA placards may be obscured. » At night. » By smoke. » By fog. 83 Occupancy and locations. Occupancy and locations. Container shapes, markings, and colors. Container shapes, markings, and colors. DOT Placarding and Labeling. DOT Placarding and Labeling. Shipping papers. Shipping papers. NFPA 704 Standard System. NFPA 704 Standard System. Occupancy and locations. Occupancy and locations. Container shapes, markings, and colors. Container shapes, markings, and colors. DOT Placarding and Labeling. DOT Placarding and Labeling. Shipping papers. Shipping papers. NFPA 704 Standard System. NFPA 704 Standard System. 84 QuestionsQuestions ? 1. 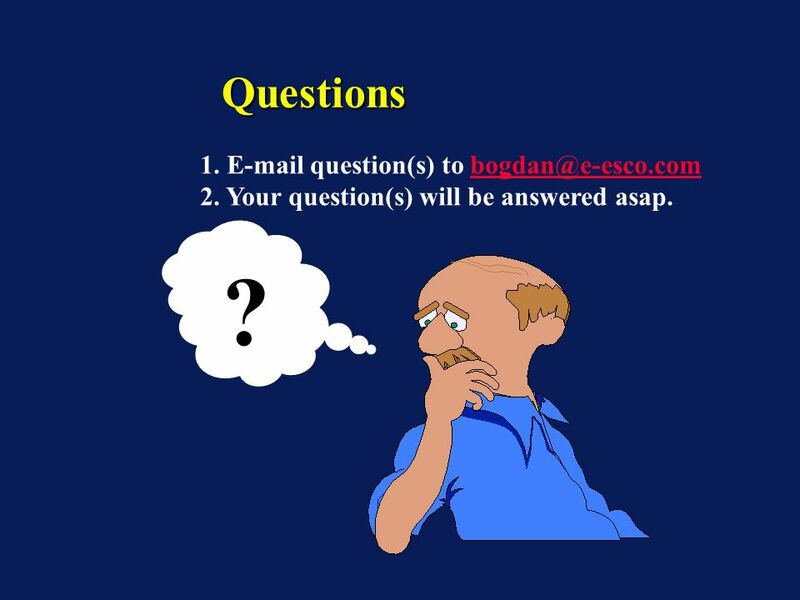 E-mail question(s) to bogdan@e-esco.combogdan@e-esco.com 2. Your question(s) will be answered asap. 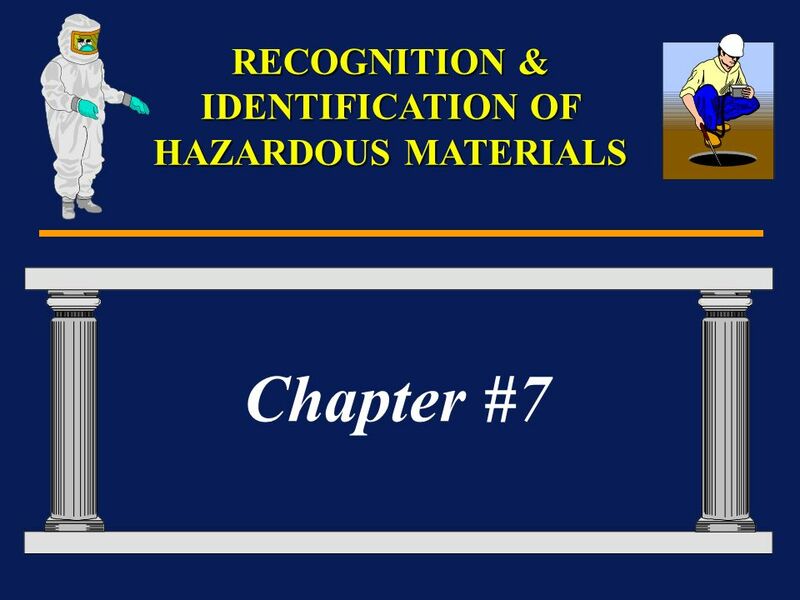 Download ppt "Chapter #7 RECOGNITION & IDENTIFICATION OF HAZARDOUS MATERIALS." Learning Objective List the major hazard classes and the most common material associated with each class. Describe the general hazards associated with. Martin Gresho, PE Fire Protection Engineer FP2FIRE. Hazard Communication and General Awareness. General Awareness – Two Key Definitions: Hazmat Employer A company/person who utilizes one or more employees. Take Cornell Notes over the information. Reactive and Explosive Materials An Introduction. HAZARDOUS MATERIALS. Hazardous materials can be silent killers. Almost every household and workplace has varying amounts of chemicals that, if spilled. CAMA 2011 Flammable, Caustic and Toxic Materials Theresa Grenier David Haasenritter. 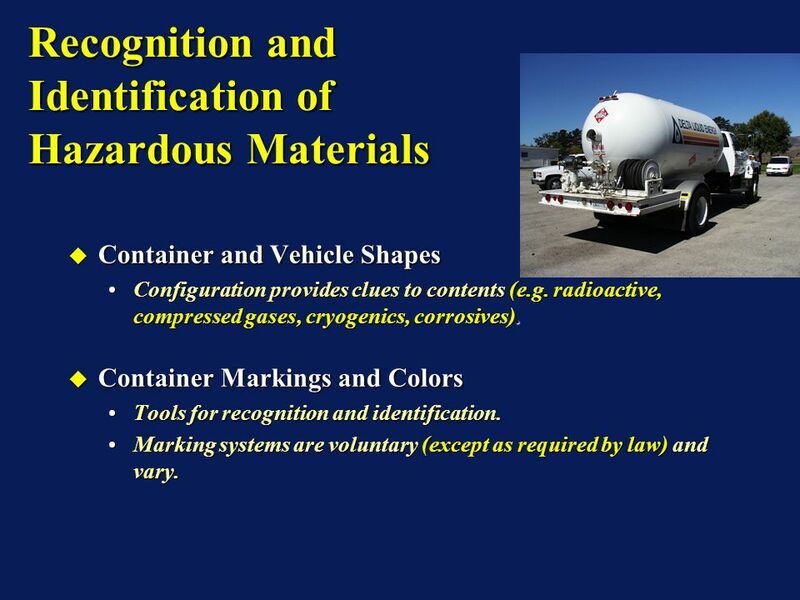 Hazardous materials awareness Chapter 6 Hazardous materials containters and packaging. Objectives Define terms associated with HAZMAT/CBRNE incidents pertaining to awareness level personnel/responders. Identify the nine United Nations (UN)/Department. Visual 2.1 Introduction and Unit Overview The role of CERTs in fire safety:  Put out small fires.  Prevent additional fires.  Shutoff utilities  Assist. Revised Spring 2007 Hazard Communication And Your Right - To - Know Dept of Environmental Safety Services.